Crossings Author | Adventures with my books, health, and life in general! 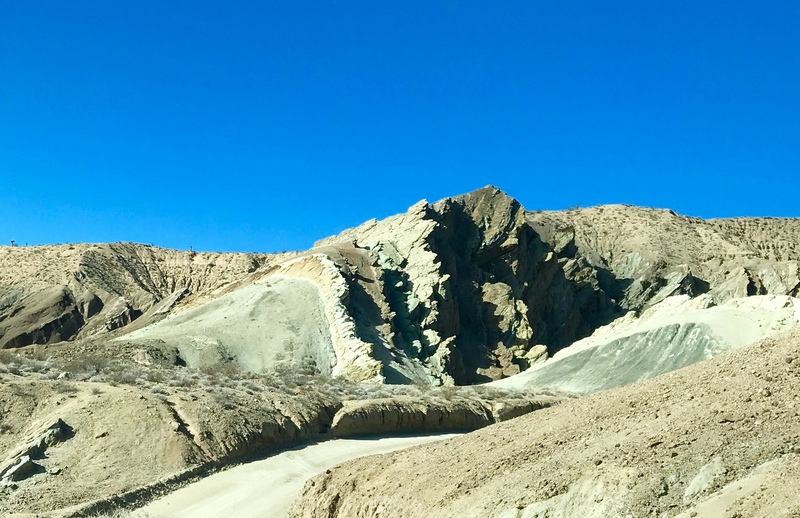 Barstow, California, isn’t everyone’s idea of a destination for a few-days getaway, but, hey, it was cheaper than Laguna—our first choice. 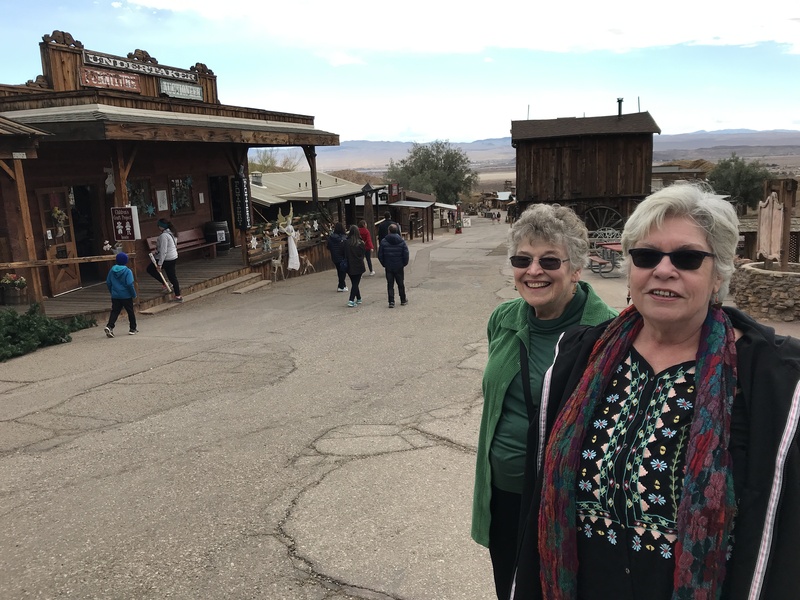 Besides, my friend, Theresa Baer, whom I was traveling with, wanted to get away from the LA area and to the wide-open spaces of the desert. And that we did. Even the weather cooperated––mostly sunny with only one windy day. Theresa picked me up in Bakersfield, where I was spending the Christmas holiday with family. Then we headed out Hwy 58, 130 miles to Barstow. When we were getting close, we followed Theresa’s directions to the visitor center—surrounded by outlet stores a few miles outside of town. Here I am at my sister’s house with her two cats, Alfie and Ziggy. We were asked where we were from and where we were headed. When we said that we were headed to Barstow, there was a pause, since that was not the expected response. But they were cool, and provided us with town maps, places to visit info, and directions to get to the actual town without using the I-15 freeway. This was the day after Christmas, and the I-15 was a parking lot—nothing was moving. After looking at the state map, I jokingly said that all roads lead to Barstow—I-15, Hwy 58, and Hwy 40. And the junction with Hwys 58 and 395 is nearby. So Barstow today is a stopping point for travelers, mainly between the LA area and Las Vegas. This town of only 23,000 has absolutely zillions of motels and fast-food venues along its main thoroughfare. In the past, its claim to fame was Route 66, as its main street through town. And nearly every business still has the Route 66 road sign. After finding our motel, tucked in among many others, and settling in, we walked to a nearby restaurant and had a terrific meal. It was Jenny’s Grill that specialized in Mexican food. Theresa had shrimp tacos and I had fish tacos with the requisite refried beans and rice. Everything was delicious. 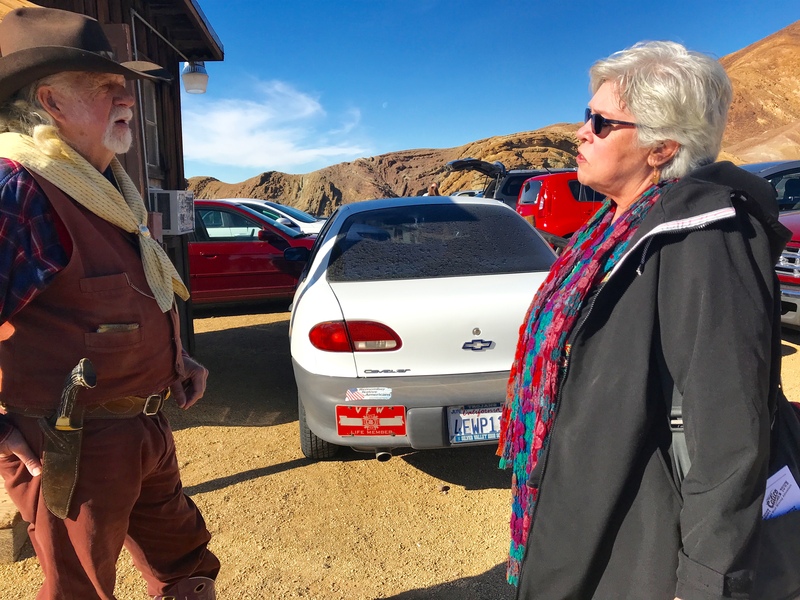 The sheriff telling his life story to Theresa after welcoming us to Calico. 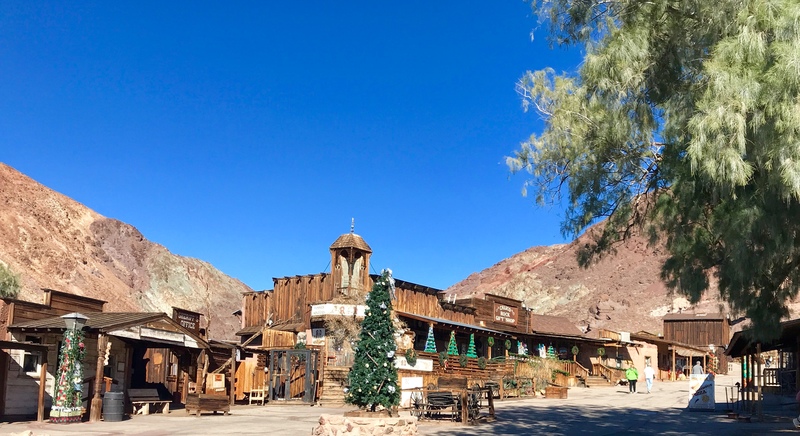 The ghost town of Calico. Many of the buildings were original and some restored. There were gift shops, replica old-time businesses, a museum, and eateries. We also took a ride on a narrow-gauge train around the area. The history was fascinating and the weather perfect. We enjoyed it all. 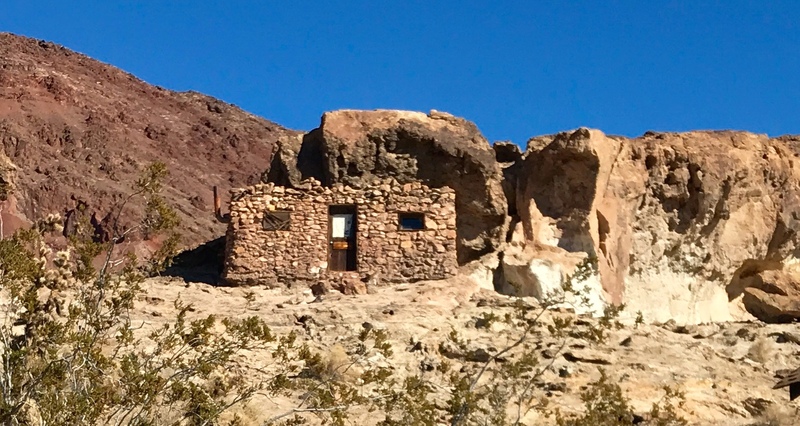 Old dwelling built into the rocks. Most likely used before wooden buildings were constructed. This fire engine could pump 600 gallons a minute. A view of mining from the train. Before leaving the area and closer to the highway, we stopped to eat at Peggy Sue’s Diner. Although it has expanded and become commercialized, we ate in the original diner area and were charmed. The waitresses were older, personable, and gave great service. We both ordered burgers, mine with curly fries and Theresa’s with onion rings. I also had a chocolate shake, which was served with the classic glass full and the extra in the metal container. We loved it all—even the 1950’s music! Nearing the end of the meal, the waitress informed us that an anonymous someone had paid for our meal!!!! Can’t remember when that last happened! 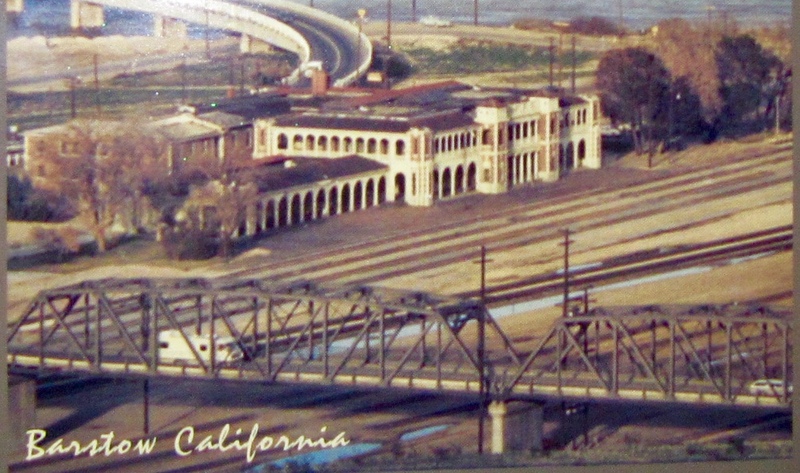 The amazing Harvey House train station about 1979. Closer to town we stopped at the historic Harvey House train station. At one time there were about 100 of these elegant stations, which were much more than a train station. There were fabulous restaurants with hotel rooms, as well as the station portion, all within an architectural wonder of a building. Back in 1946, there was even a movie called The Harvey Girls starring Judy Garland. Today there are only about 30 Harvey Houses remaining, and the one in Barstow is the largest. And it is not a historic relic but a vibrant part of the community. It houses 14 businesses, including three museums––the Space Museum (NASA Goldstone Visitor Center), Barstow Route 66 Museum, and the Railroad Museum. The only one open on Day 2 of our trip was the Space Museum, so we checked it out. It covered the many milestones of the past space programs, what is happening today, and future plans. Barstow’s connection to space is the nearby Goldstone Deep Space Communications Complex with its numerous antennas that communicate with manned and unmanned spacecraft. NASA needed a remote location free from radio signal interference, and the Mojave Desert fit the bill. The first antenna was built in 1958, and every few years, more were added. The complex is one of three on earth that are part of the Deep Space Communications Network. The others are located near Madrid, Spain, and Canberra, Australia. We were impressed! Who knew such important space related work was going on near Barstow. Instead of the comp breakfast at the motel, we headed across the highway to a small shopping center and Lola’s Kitchen. It turned out to be another Mexican restaurant. I ordered scrambled eggs with all kinds of great stuff mixed in with the eggs, but requested that the optional jalapenos be left out. It was the first time for me to have rice and refried beans with breakfast and to be asked if I preferred corn or flour tortillas. When the waitperson noted my hesitation, he asked if I would prefer an English muffin. I quickly said, “Yes!” Theresa had a breakfast burrito with chorizo. Everything was yummy. This was a very windy day, but it was okay, since we would be indoors. We had four museums to visit on our schedule and two were in town. So we headed to those first. The Mojave River Valley Museum was heavy on geology of the area with lots of rocks on display and many books. Theresa bought some of the geology books. It was a great small museum, and the volunteer on duty gave us each a cookbook put together by the folks that volunteered there. The next museum was nearby and had a fabulous building and landscaping that was exactly what you would expect in the desert. But it was closed because of the federal government shutdown. Dang! 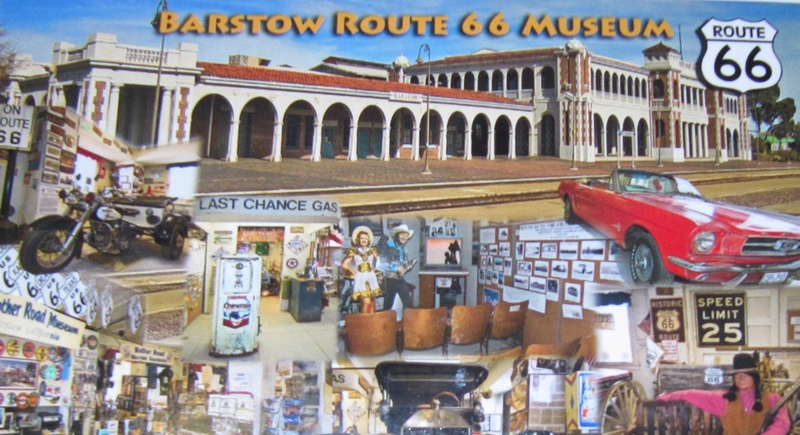 A postcard from the Barstow Route 66 Museum. Next we headed to Harvey House where the other two museums were located and only open Friday through Sunday. The Railroad Museum was closed because no volunteers were available during the holidays, but the Barstow Route 66 Museum was open. There was a 1964 ½ red Mustang and many displays of what life was like in the 1960s. Of course, we remembered the TV program “Route 66” (1960-64) with two young men in a Corvette having adventures all along the way. It starred Martin Milner and George Maharis. We also remembered the popular theme song for the TV program “Get Your Kicks on Route 66” originally recorded by Nat King Cole and then others such as Ray Charles. For both Theresa and me, the whole museum was a step back in time and great fun! We each bought Route 66 T-shirts. 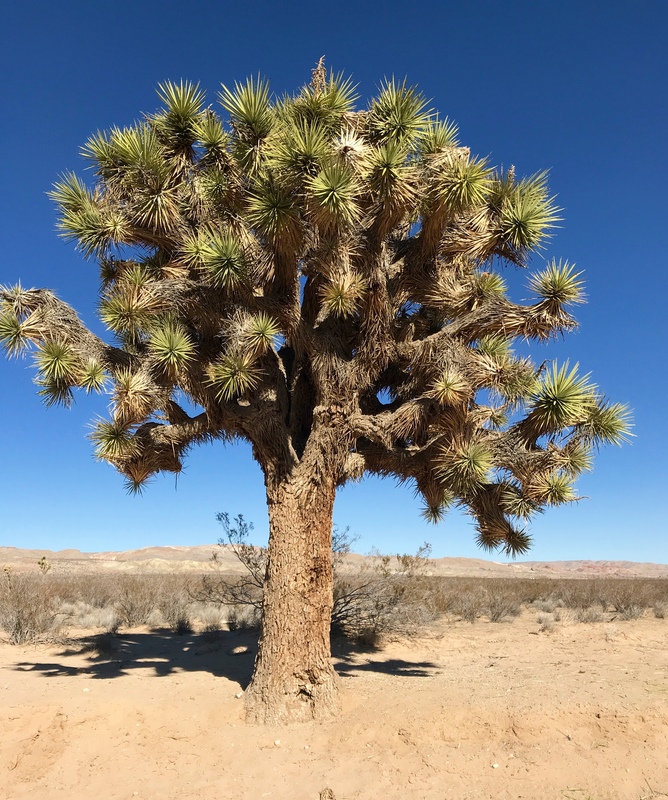 We passed this perfect Joshua tree on the dirt road leading to Rainbow Basin. Then we were off to Rainbow Basin. Again, the wind wouldn’t be a problem because we would be staying in the truck. After taking a highway out of town, we turned on a wash-boarded, two-lane dirt road for several miles before turning into a narrower, one-way loop also dirt that was as wide as a narrow driveway. It was hard to go faster than 5-10 mph, but you didn’t want to. There was so much to see. We loved it! We saw only a few other vehicles, and they also stopped every couple of minutes to gawk or take photos. Some of the interesting formations in the Rainbow Basin. Some formations looked like ruins in Egypt. Others looked like small versions of Bryce Canyon. There was what looked like mudstone along the sides of the road, and the topsoil looked like dried mud and was flaking. This was the desert and everything was as dry as could be. But everywhere were signs of where water had been. The colors weren’t as vivid as Oregon’s Painted Hills, but there were pastel variations of red, green, beige, and more. As we got closer, we were surrounded by rocky formations. I kept saying, “Oh, look!” and Theresa, “Now what do you suppose caused that?” We saw examples of uplift, fracturing, and erosion, which exposed many layers of soil, rock, and colors. It worked out well for us to have seen the museum explaining the geology of the area and then seeing many examples at Rainbow Basin. It was fascinating! Strange rock formations, greenish tint to area, and notice narrow road. Back in town, we had a late lunch at Habibi’s that had Mediterranean food. I had lentil soup with hummus and pita bread. Theresa had a chicken and rice dish. Both of us were happy with what we ordered. Then we headed out to the outlet stores for a little shopping. Outlets have reduced prices anyway, and they are reduced even more after Christmas. So why not! I found great deals on some pajamas at Calvin Klein and a fleece vest at Columbia sports wear. It was dark before we got back to our motel. It had been a very full day. We returned to Lola’s Kitchen for more Mexican breakfasts. We both had variations on the scrambled egg breakfast, and both were yummy! Then we hit the road about 10 a.m., heading back to Bakersfield. The weather was good and the traffic in our direction was not bad. Not so in the other direction. That was a different story. It was the Saturday morning of New Year’s weekend and many folks were heading to Vegas. We arrived in Bakersfield about 12:30 p.m., which gave Theresa time to continue on to the LA area and arrive well before dark. On our drives to and from Barstow, we saw many trains since the tracks paralleled the highway. The trains had multiple engines, several double-decker cars, and were very long. Here in Calico and throughout the trip, we had a good time. 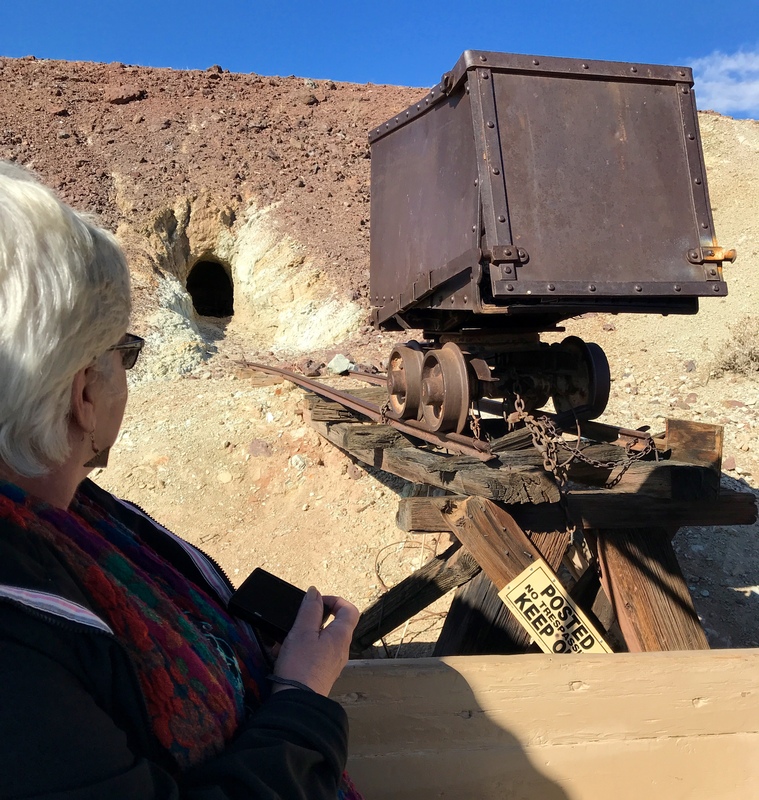 On this trip, we started with Theresa’s list of places to visit in Barstow and the surrounding area, but had no idea how they would measure up. As it turned out, we were pleasantly surprised over and over. We had plenty of worthwhile places to visit to fill our time, and plenty of good eateries that were not fast food. So in spite of everyone’s raised eyebrows when we said where we were going, visiting Barstow turned out to be a delightful trip. We thoroughly enjoyed it. 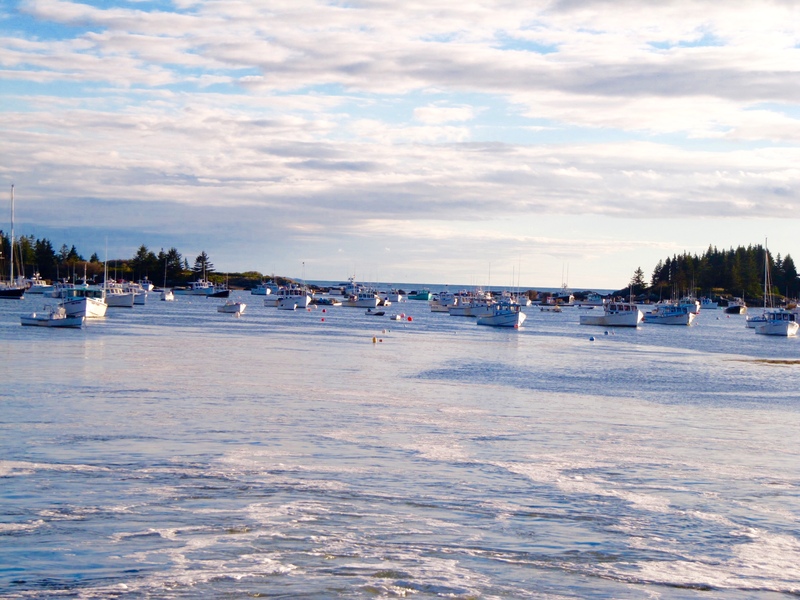 We end up our trip in Maine in two of the most well known locations in all of Maine––and two of the most mispronounced. Every time I mentioned Bar Harbor, folks would immediately go into the Bah Habah routine. So that’s what I expected, but folks who actually lived there pronounced it Bar Harbor. Go figure! And, of course, most of us want to say Arcadia National Park instead of Acadia National Park. The folks at the park realize this and, in the film about the park that we watched, make a point of the correct pronunciation. As we were wheeling our suitcases down the street in Vinalhaven, a car stopped. A women we had not met asked it we wanted a ride to the ferry terminal. We accepted, and she stayed right where she was in the middle of the street as we loaded our stuff and got in the car. A different view of Owl’s Head Lighthouse. Unlike the trip on the ferry to Vinalhaven, the trip back was smooth with no rain. 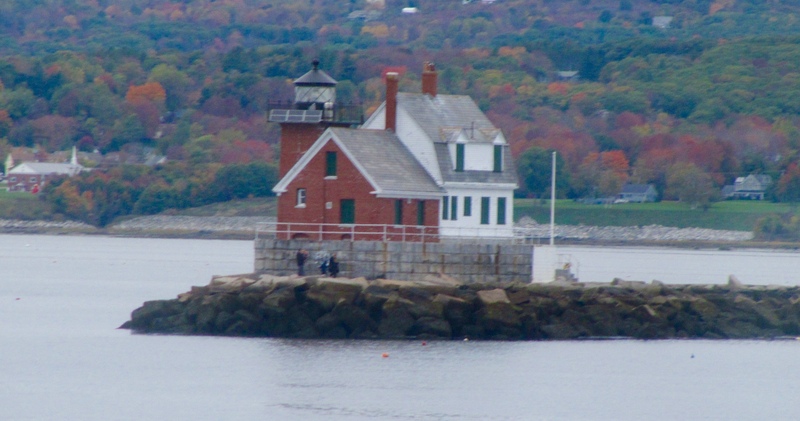 I was able to see Owl’s Head and Rockland Breakwater Lighthouses and take photos of them. This Rockland Breakwater Lighthouse is at the end of a nearly mile long breakwater. On the mainland, however, it was raining. Our car was still in the shelter of the fishing boat where we left it. The nearby boat storage doubled as ferry terminal parking while the ferry parking lot was being redone. While we thought it a bit strange to see cars tucked in next to boats of every description, everyone else seemed to think it was normal. We headed off to Bar Harbor. 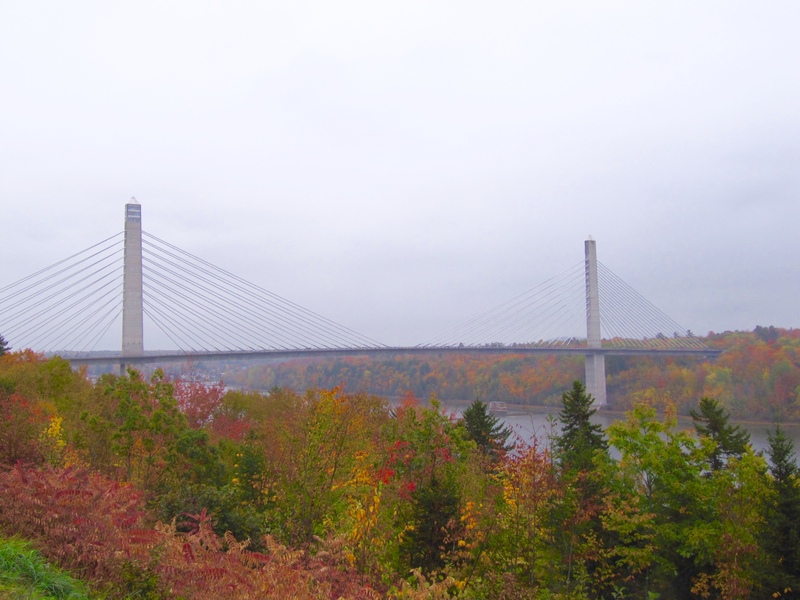 Hwy 1 took us up Penobscot Bay until we came to the Penobscot Narrows Bridge and Observatory. The tall pillars of this bridge rise 420 feet with an elevator in one of them to take visitors to an observation room at the top. This was one of the places that I wanted to visit, to ride the elevator to the top, and to observe Maine from that high up with a 360-degree view. Because of the heavy rain and low cloud cover, we just stopped and took photos before driving across the bridge. Dang! 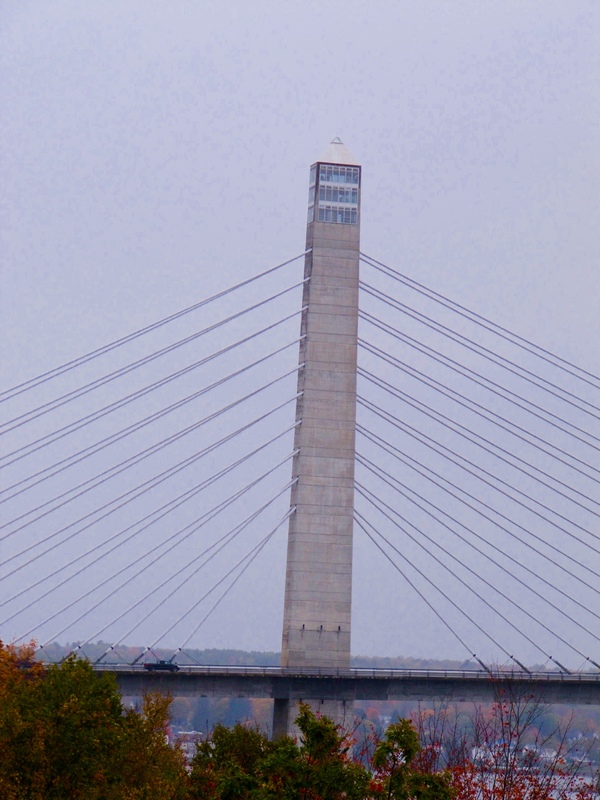 The observation room is at the top of one of the pillars of the bridge. Photo taken during heavy rain. 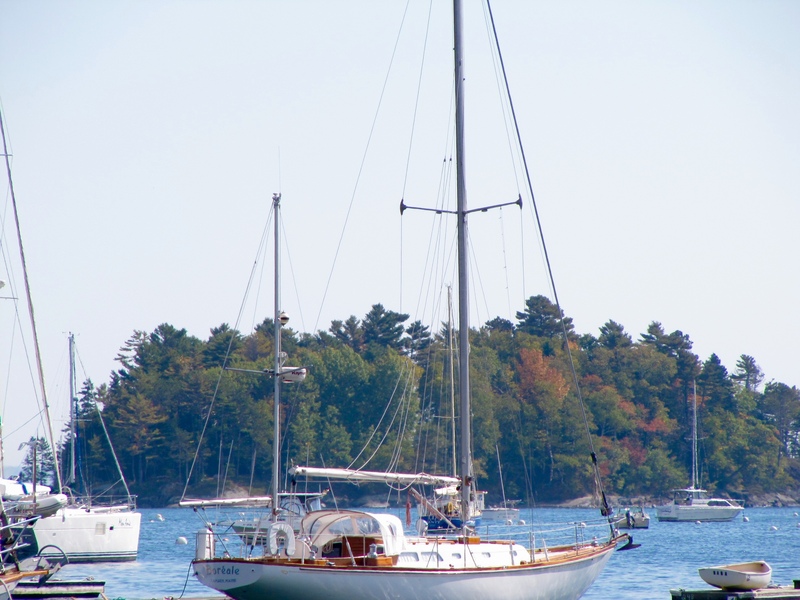 It didn’t take long to reach Ellsworth and head south to Bar Harbor and Acadia National Park. They are on an island. It was such a short connecting bridge that it seemed we were crossing a river. 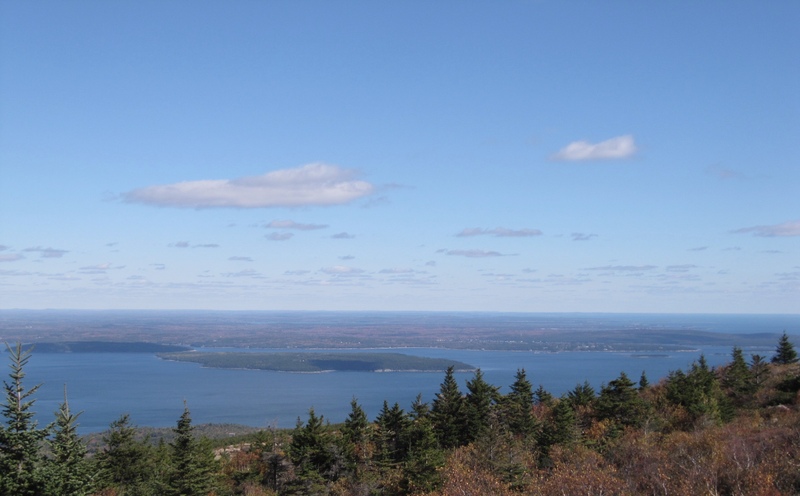 It is Mount Desert Island and the location of the largest and most popular segment of Acadia National Park. Our motel was outside of town. It was a Days Inn and when we got there mid-day, we were initially told that our reservation had been canceled. That was a bummer cause there was a bicycling race in the area and no lodging was available anywhere. But she kept looking and discovered that the owner had cancelled our reservation and moved us across the highway to a Holiday Inn. That was a relief, but it would take some doing to get there. Penobscot Bay had narrowed considerably by the time we got to the bridge. The tree colors come through even in the rain. This section of Hwy 3 was being worked on and had only one-way traffic. We would have to take a detour through the national park and retrace Hwy 3. So we did, but could not see any sign to a Holiday Inn. So we went around again. This time I saw the sign, unlit and behind trees. Evidently, it was now a part of the Bar Harbor Regency, which was nearby. It had taken the better part of an hour, but we finally found our hotel and got checked in. Our room was very nice, and on an upper story. It was a bit of a walk to the Regency, which had the Bella Vita Restaurant. It was the second best meal of the trip. I had a minestrone type soup with a great caprese salad and to-die-for bread and good wine. Back in our room we watched TV, continuing the adventures of the North Forest Fish and Wildlife. After a terrific breakfast buffet at the Bella Vita, we spent much of the day seeing the sights of Acadia National Park. The rain had stopped and it was a gorgeous day. Unfortunately, we were not the only ones. It was a sunny Sunday and one of the last days portions of the park would be open, which we did not realize. But we saw tons of people everywhere. There was bumper-to-bumper traffic and circling parking lots to find a place to park. That was the bad part. The good part was the beautiful colors of the trees and fabulous views from the top of Cadillac Mountain. We stopped at the entrance lodge and stood in line for a day-pass. While there, Edna bought me a telescoping cane for my birthday, which would be in a few weeks. We also saw a film chronicling the history and beauty of Acadia. The Atlantic Ocean from Cadillac Mountain. Then we headed up to Cadillac Mountain. At 1,530 feet, it is the highest point on the East Coast. That was hard to believe for us from the west where mountains tend to have a bit of steepness to them. This was like a high softly rounded hill with scrubby growth and lots of granite showing—thus the name Mount Desert. But the views were spectacular—all 360 degrees. Another view from Cadillac Mountain. Next, we headed to Jordan Pond. It’s a lovely lake with a grand house famous for its popovers. Since we were here, we felt we had to partake. I think we circled the parking lot a dozen times before finding a spot. I remembered reading that Acadia is one of the most visited national parks in the country. On this day, I believed it. 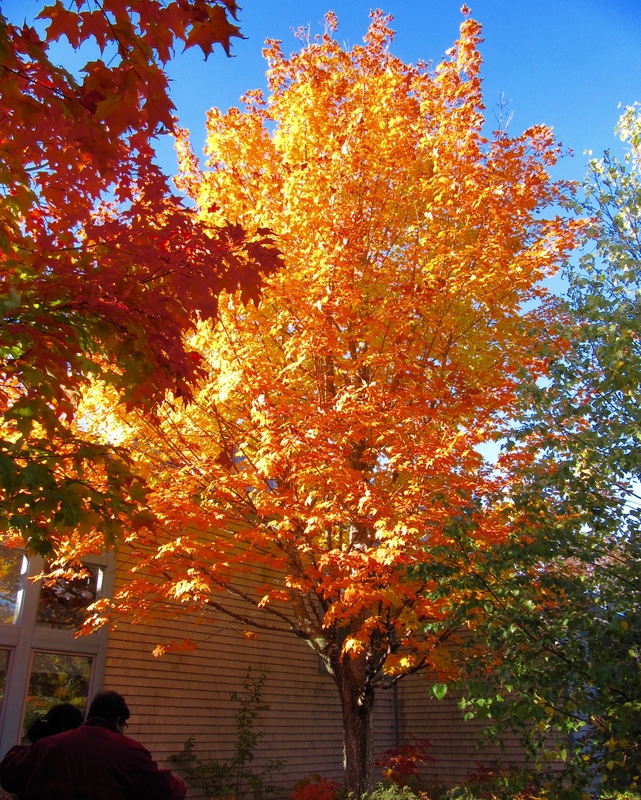 A beautiful tree right outside the Jordon Pond House. There was a nice trail through the trees to the Jordon Pond House and some gorgeous tree color. Once inside, we had to wait a half hour to be seated. We placed our order and were brought some popovers and then surprisingly some more. They were quite good even though our waitress forgot the strawberry preserves for the first ones. Then she wanted to know if we were ready for our bill, and we said we were ready for our order. Her response, “Oh, that’s why they were there.” So my lobster stew was no longer hot. Even so, it was very good. We found it was the last day for the lodge to be open for the season, and our waitress was definitely ready for it to be over. After eating, we browsed the gift shop, and I got a couple of things. The trees were lovely throughout the park. We drove around the park a bit more and then headed for Bar Harbor. It was another charming seacoast village. We browsed the shops and headed back to our lodging. We were still full, so no dinner that night. But we did watch more North Forest Fish and Wildlife adventures..
We enjoyed the last day of the wonderful breakfast buffet for the season. 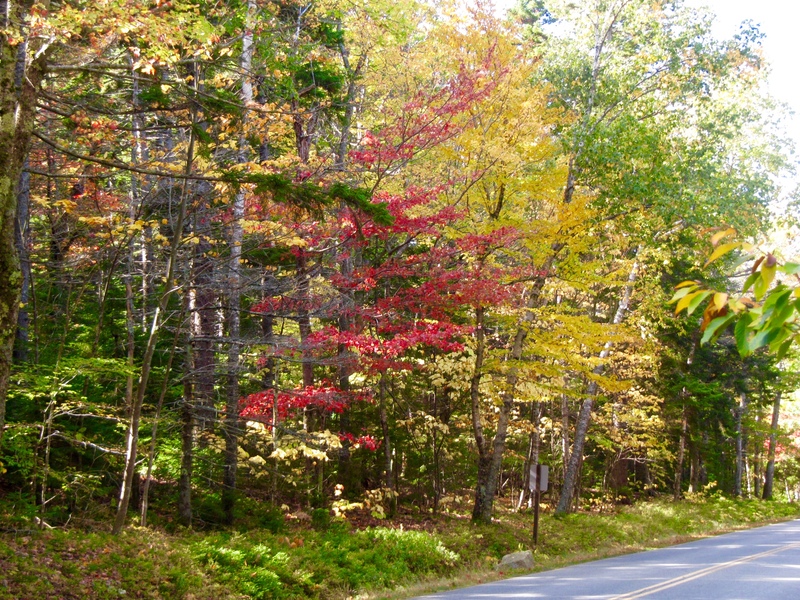 Then we drove inland to Ellsworth and headed on Hwy 1 to Schoodic Peninsula for another segment of Acadia National Park. Although this was a cloudy Monday, not a gloriously sunny Sunday, this segment of the park had no traffic. Occasionally, we saw another car. Couldn’t have been more opposite. Winter Harbor (Mark Island) Lighthouse as seen from the one-way drive through the Schoodic Penninsula portion of Acadia National Park. 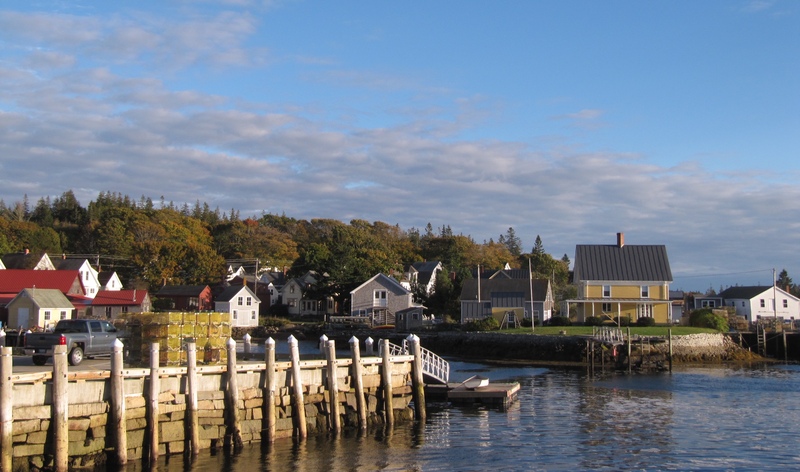 We checked out a couple of small towns––Winter Harbor and Prospect Harbor. Both very small and neither touristy—just very small coastal towns where the main industry is fishing. In one of the towns, we found a tiny bakery located in the glassed in area of the entry to a large house. We stopped and got coffee/tea and pastries to go. We found the entrance to the park—no day-pass needed here. Drove along water, it was an inlet. Stopped at Frazier Point to enjoy our pastries. Saw a couple of lighthouses across the way. One was Winter Harbor and the other Prospect Harbor Point Lighthouses. Got some photos, too far away to be any good. We drove on out to Schoodic Point and found several cars and the Atlantic Ocean in the distance. First time to see the ocean since we left the southern beaches area, except for when we were on top of Cadillac Mountain. Since entering the park, we had been on a one-way road. 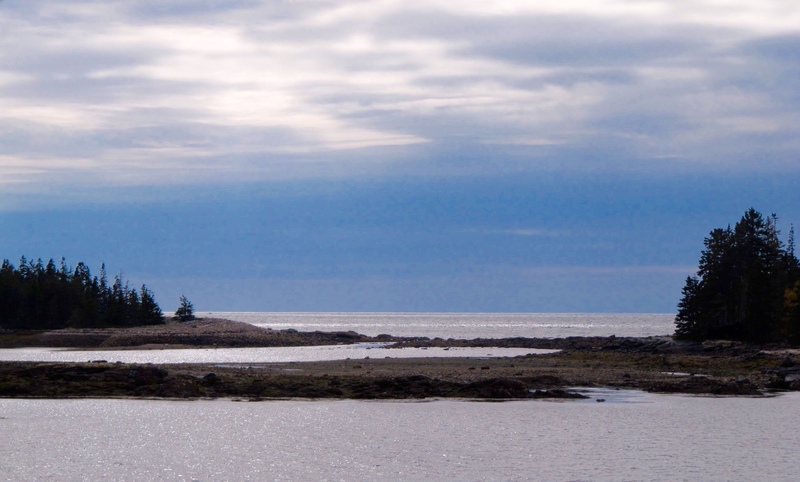 It took several tries to find a two-way road to get off Schoodic Peninsula. Did I mention that signage left a bit to be desired. We ran into rain on the way back to our lodging. Schoodic Point with Atlantic in the distance. That evening we had dinner once again at Bella Vita. I wanted the same as before, but they were out of the wonderful soup. So I had an Italian dish that started with ‘t’—something like tagilitini. It was good. And I had the same wonderful caprese salad and bread and wine. Edna had their pizza. Back to our room and we watched more North Forest adventures. 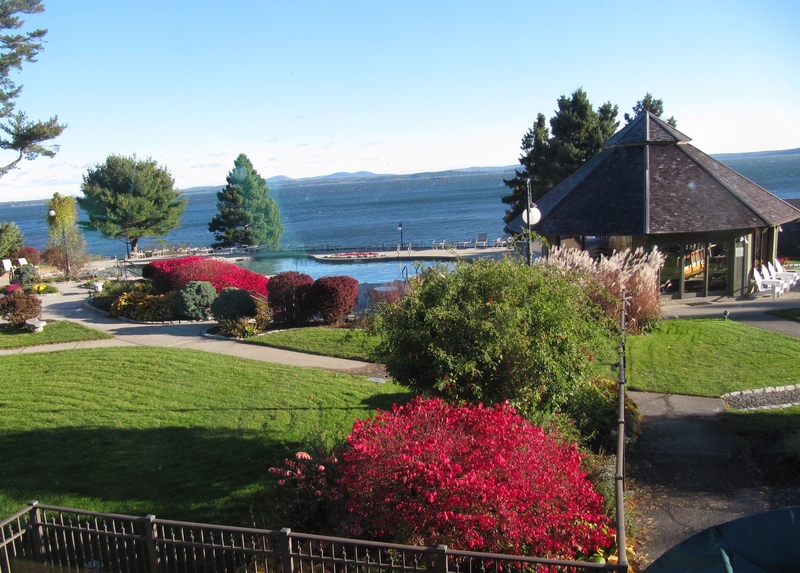 The grounds at the Bar Harbor Regency as seen from the Bella Vita Restaurant. We missed the wonderful buffet and had a regular breakfast at Bella Vita. We packed and left by 11 a.m. Our vacation was nearly over. We took the faster route via turnpike back to the Portland area. We took I-95 and I-395 both part of the turnpike. The trees were lovely, and there was little traffic and good signage. What’s not to like. The $1 toll was definitely worth it. We stopped at Freeport, home of L.L. Bean, to gas up the car and to get a snack. When we got off the turnpike, we turned the wrong way and everything was L.L. Bean. When we got turned around in the right direction, we found what we needed. The airport is actually in South Portland, a separate city. The signage getting from the turnpike to the Days Inn near the airport where we would be staying, was tricky. Thank goodness for the Mapquest directions I had run off prior to the trip. It helped us navigate our way. Once we found the motel, it took three clerks before one could figure how to check us in. Because the price was different through the third party booking agency, the computer system wouldn’t cooperate. But finally, one gal said she had dealt with the problem before and figured a way around. Whew! Before heading to our room, we got directions to the airport so we could return our rental car. We only unpacked what we absolutely needed because we would be getting up at 4 a.m. for a 5 a.m. shuttle to the airport. After we got settled in, we went down and told the front desk that we would be heading for the airport to return our rental car. They would send a shuttle to bring us back. When we got to the car rental and pulled into a slot. A fellow with a clipboard was instantly at my window, saying, “Judith?” I asked him how he knew my name, and he said they were expecting the car to be returned that day. Duh! We waited awhile for the shuttle, and it took us back to the motel. Since it was dinnertime, we headed next door to a Mexican restaurant. Edna had fajitas and I had enchaladas. They were good. Because of our early wake-up call, we hit the sack early. We were up and out in record time––brushed out teeth, wore the same clothes as the previous day, and packed the little we had taken out of our suitcases. And we weren’t the only ones in the lobby waiting for the shuttle to the airport. Before we left, the driver prepared a boxed breakfast for each of us, since we were too early for the comp breakfast. It was unexpected and very much appreciated. We ate ours while waiting at the airport. The plane left 35 minutes late and was full. We each got the dreaded middle seat and, of course, didn’t sit next to each other. I had a nice chat with one of my seat partners. And she also had been interested in the lighthouses. 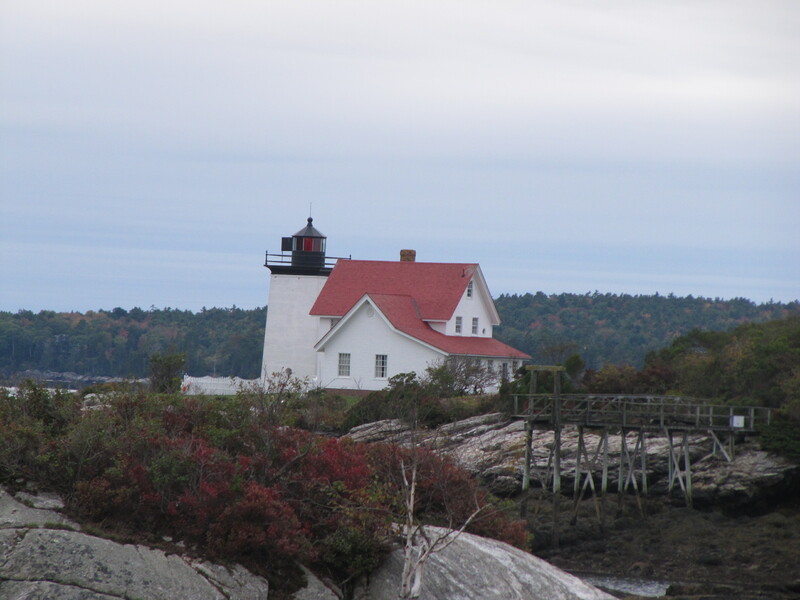 She and her husband had gone farther north than we did, so she got a photo of Quoddy Lighthouse, the one with the red and white stripes. She said she would share her photo with me. 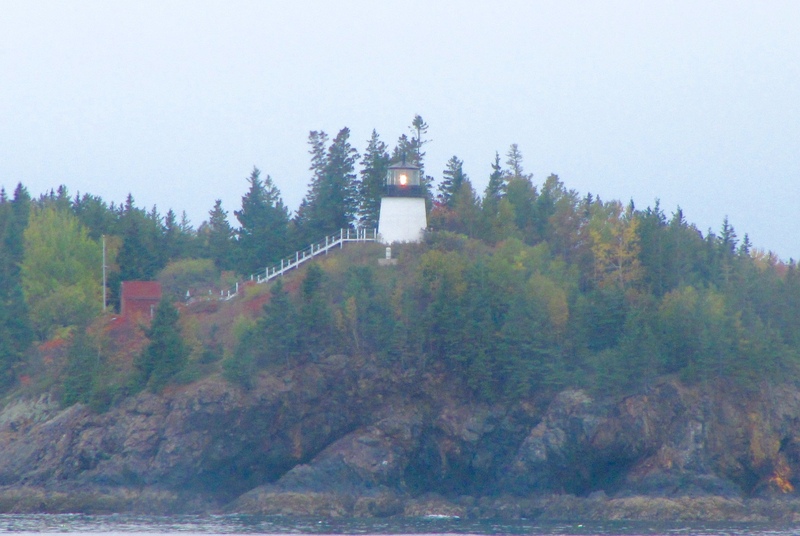 West Quoddy Lighthouse is farther north than we traveled in Maine.It is located on the easternmost point of the continental United States. We had an hour and a half layover in Chicago but we were at least 35 minutes late. It took awhile to find a departure/arrival board to discover our gate. Since it was a different terminal, we had a ways to go. Fortunately, there was a people conveyor belt. That helped. And it was decorated above with a neon light display. Very impressive. Once we were in the right terminal, more walking. When we saw our gate number in the distance, we turked into a restroom. Then we continued onto our gate. They were boarding our flight when we arrived and were on Group 3. We were Group 5. Whew! I don’t like cutting it that close. Again we had middle seats, and this time we were across the aisle from each other. We both had books to read and could wave at each other. We arrived at 12:45 p.m. in Portland, Oregon, and surprise, surprise, it was 75 degrees. We retrieved our luggage and than I stayed with Edna for awhile. She got checked in and her boarding passes for her two flights to Bakersfield. We found a place to get some coffee and a cookie for a quick lunch. Then we parted. She headed to security and wouldn’t have long to wait for her flight. And I headed for the tunnel back to the parking garage. I found my car easily, but had to turn my purse inside out to find the long-term parking ticket. Finally found it. It was a stressful bumper-to-bumper drive along 1-205 because of road construction. And it continued heavy as far as I-5 to Woodburn. I finally got home about 7 p.m. I was really tired. I talked to Carole, the gal who rents my downstairs and takes care of Groucho when I’m gone, and received a loving welcome from Groucho. He was very glad to see me . . . for days. Book lodgings ahead, but not through third party. Go onto the booking sites to find what you want, and then book through actual lodging. Plan trip earlier in the year, less chance of rain and places won’t be closing for the season. Didn’t realize that so many coastal tourist facilities are closed during the winter. The geology of the coast of Maine is so different than that of Oregon. 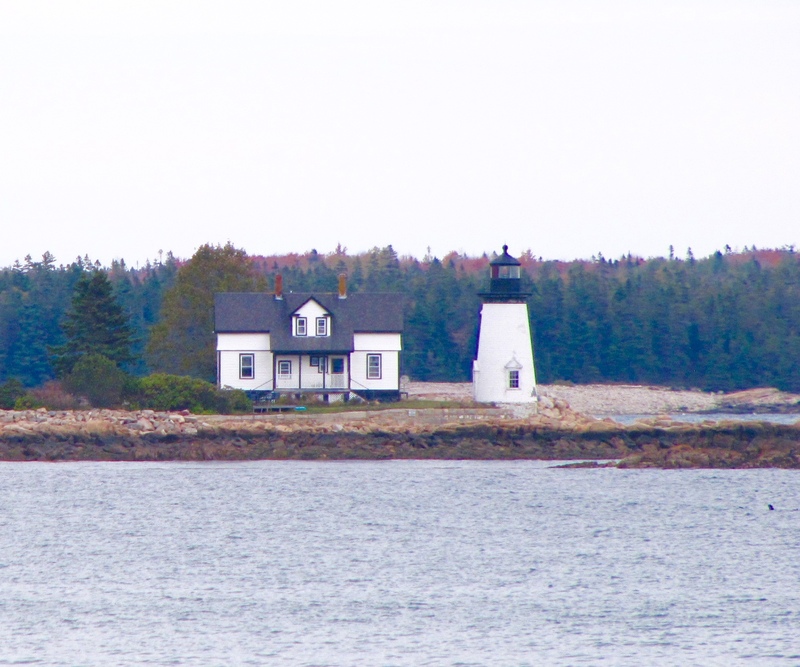 Maine has so many lighthouses, 67, and so varied. Surprised that many were attached to houses. 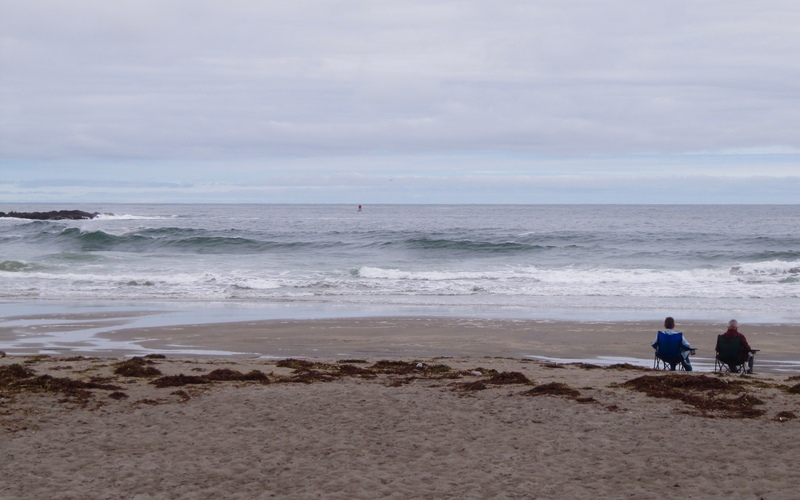 Also surprised that many were shorter than our shortest one on the Oregon coast—Capes Meares at 38 feet. 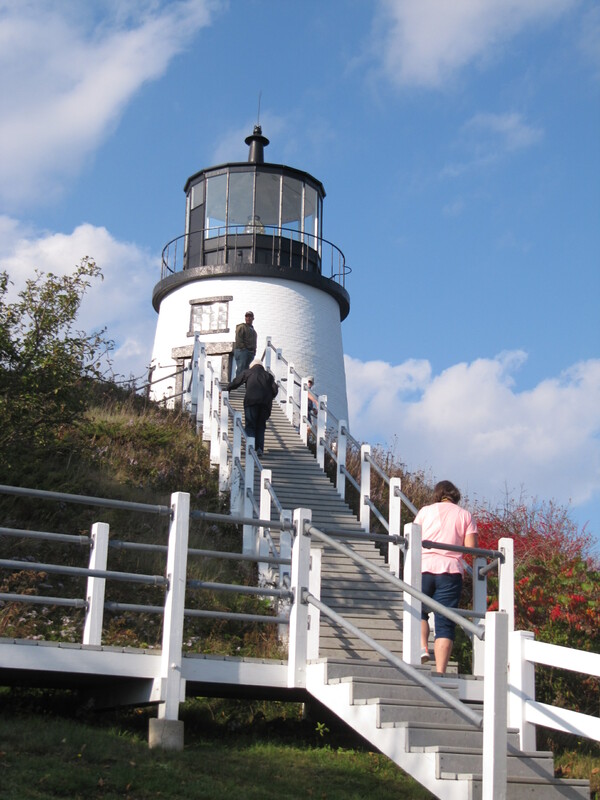 Nearly all of Oregon’s lighthouses have a range of 21 miles, but the ones in Maine can be anywhere from 12 to 29 nautical miles. Lobster tastes good no matter how it’s prepared. Wonderful trip. Yes, I’d do it again. Yes, I’d recommend it. 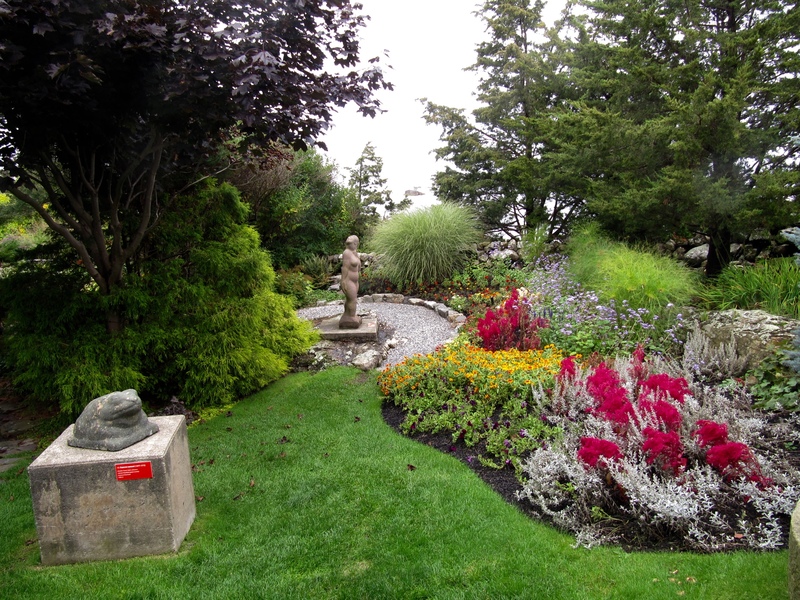 On this segment of the trip were two major highlights—the Farnsworth Art Museum and Vinalhaven Island. One is the epitome of what a major art museum should be and the other is like stepping back in time when small-town friendliness extended to trusting strangers. 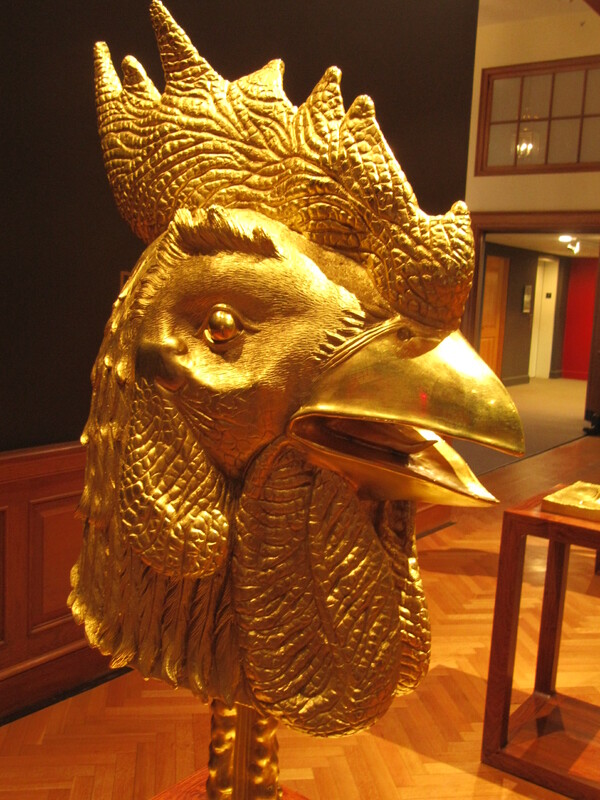 Here is the Rooster from the Ai Weiwei collection on exhibit at the Farnsworth Art Museum. It took only an hour and 15 minutes on Hwy 1 to drive from Boothbay to Rockland. It was about 10:30 a.m. when we arrived at the Trade Winds and they allowed us to check in early. 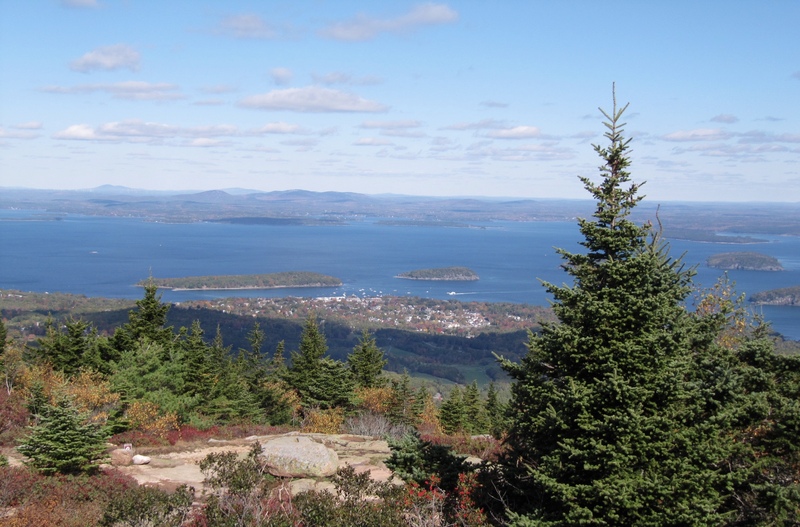 We had great views of the water—huge Penobscot Bay with its numerous islands. We settled in and then walked around the corner to town and the Farnsworth Art Museum. 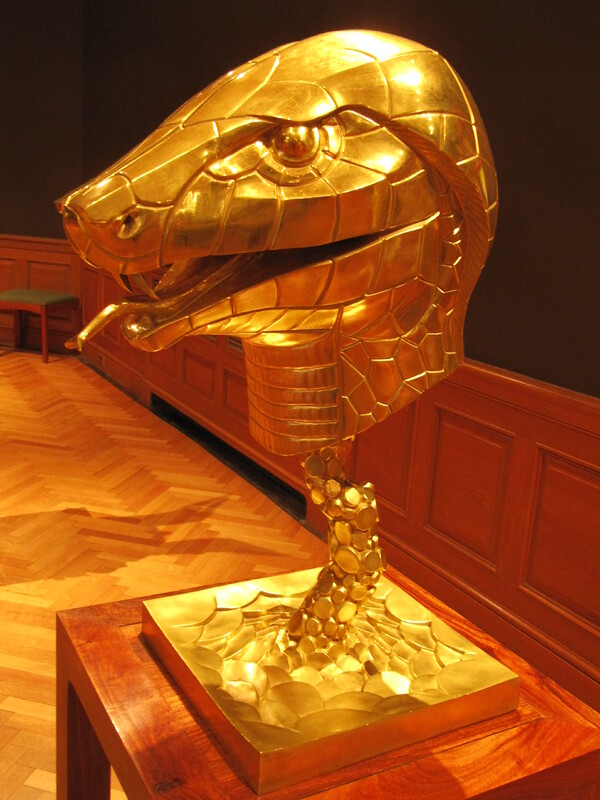 We were in luck as the Ai Weiwei collection of golden sculptures of Chinese animal/Zodiac heads were on exhibit. You could walk right up to and around all 12 of them. Ai Weiwei is a renowned international artist, and we did not know of this exhibit beforehand. What an absolute treat! And here is the Snake. The museum has 20,000 square feet of exhibit space with 15,000 pieces offering a nationally recognized collection of America’s greatest artists, including N.C., Andrew, and Jamie Wyeth, Homer Winslow, and Edward Hopper among many recognizable names. Going through the Farnsworth was one of those once-in-a-lifetime experiences. So we enjoyed every moment. Charlie Erskine by Andrew Wyeth. For lunch, we wandered up the street to Clan McLaren, which was wonderful. Back to Farnsworth, where we walked to a nearby church, which is part of the Farnsworth. This is where we saw many Wyeth paintings. 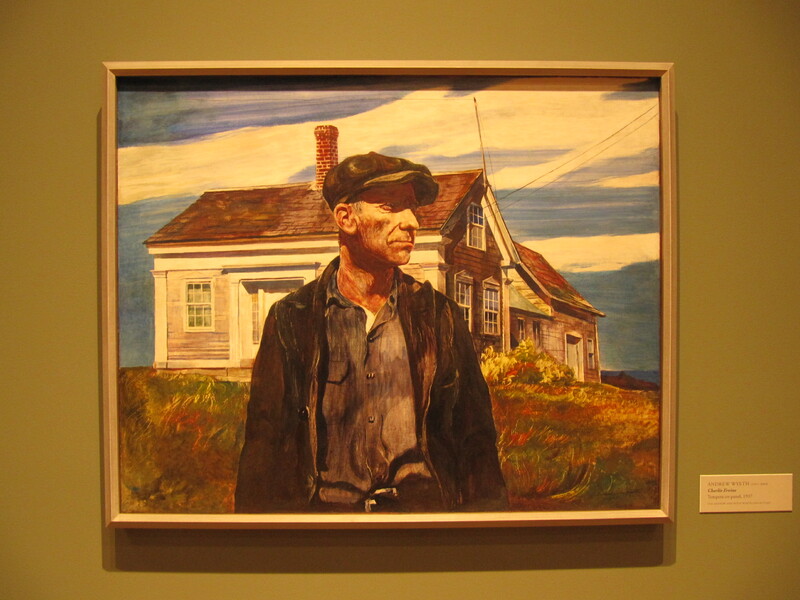 My favorite Wyeth was Andrew. His best-known work is Christina’s World, which was not on exhibit here. For dinner, we walked down to the waterfront to The Pearl. Had mussels—very good! 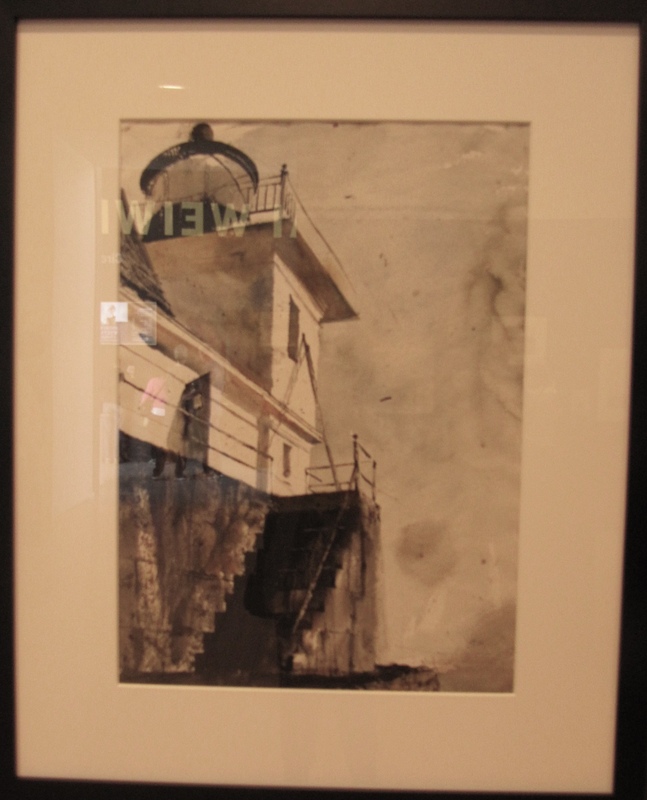 Rockland Light by Andrew Wyeth. Sun rising out of Atlantic. Strange sight to West Coast follks. I opened the drapes to see the tip of a red ball starting to rise out of the ocean through the fog. Called to Edna, and we were transfixed. 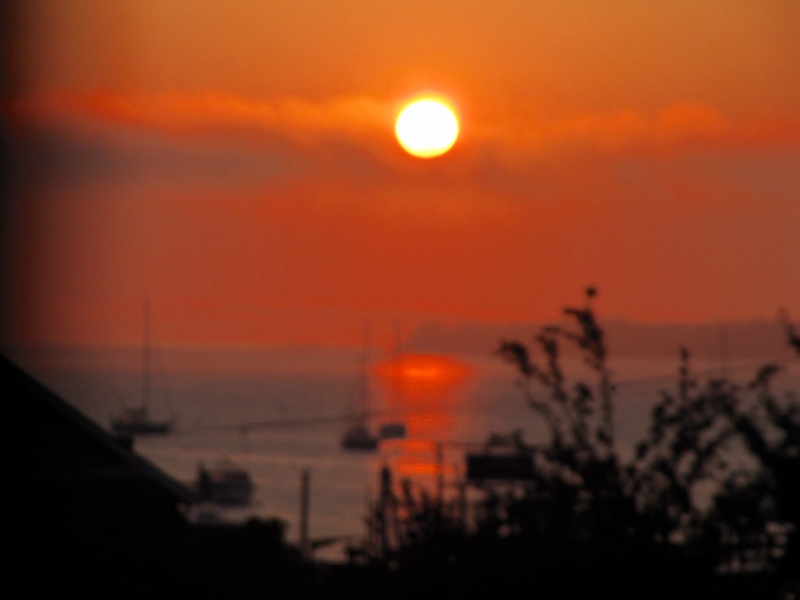 We’re used to the Pacific Coast where the sun sets in the ocean, not rises out of it. I finally roused myself and got my camera. There was a bit of reddish fog, but the sun getting higher started looking more normal. 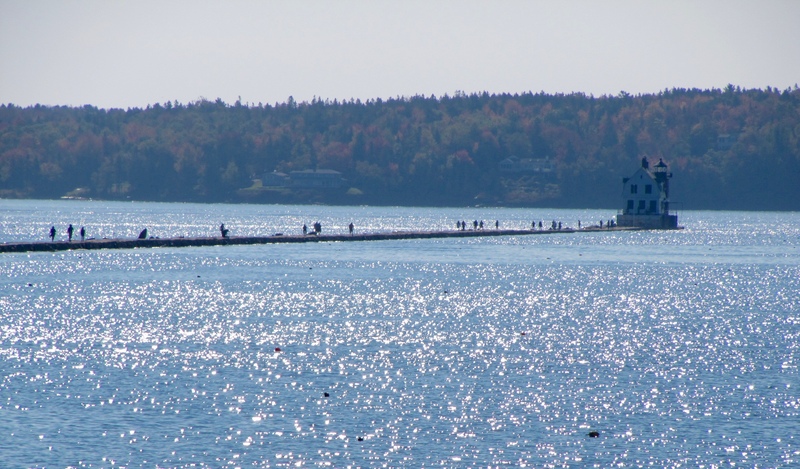 It was almost a mile out to the Rockland Breakwater Lighthouse along the granite breakwater. Curtis Island in Camden Harbor. Owl’s Head Lighthouse was a bit of a hike, but we could get right up close to it. Don’t think I mentioned previously that I started using a cane on this trip, to see if I could keep up with sister better. And it would be helpful because we were going to be doing a lot of walking. People treat you differently. They get out of your way, open doors for you. And in coffee shops where there might be just one table not in use and you have to get in line, just put the cane there and that saves it. A young couple looked at me when I did that and said, “Hey, I’m not messing with you!” Who knew! Marshall Point Lighthouse. We could practically drive right up to it. In the search for Curtis Island Lighthouse, we discovered the town of Camden. A delightful town. We checked out some shops, bought a couple things, and then found a cool place for lunch. It got really warm—90 degrees we heard later. It cooled down to the 70s by afternoon. Then we found Owl’s Head Lighthouse without any problem. Quite a walk, missed my cane, and then a bit of a hill, but we could get really close. Then we drove out to Marshall Point Lighthouse. This was easy. No walk at all and you could walk right up to it. That evening, we walked to Ada’s Kitchen, a very trendy place that specialized in Italian food and was crowded and had tiny tables with uncomfortable stools. But the eggplant Parmesan was very good. We enjoyed our stay in Rockland. Vinalhaven the town on Vinalhaven Island. We packed up and headed for the ferry to Vinalhaven Island. After much back and forth, we decided to be walk-on passengers and not take the car. It was a rainy day. Since the ferry terminal parking lot was being worked on, we parked in a boat storage area tucked under the prow of a fishing boat. 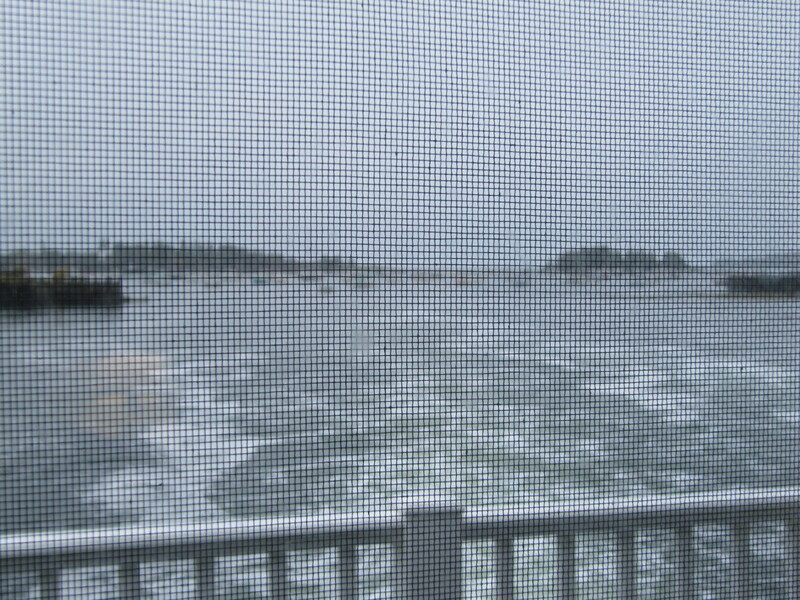 On the ride over, it was stormy and the water choppy, but the ferry was stable. We saw Owl’s Head and Rockland Breakwater Lighthouses from different vantage points. The trip took one hour and 15 minutes. There were only four passengers on our side of the ferry. I asked the older fellow if he took the ferry often, and he gave a very Maine type of answer, “Not any more than I have to!” The fourth passenger knew him and asked us if we needed a ride to the motel. (She could tell that we were visitors to the island and because of only one motel in the small town, she knew where we would be staying.) When we docked, it was still raining, so we really appreciated the ride. Water rushing out below our deck at the Tidewater Motel. Photo taken through screen and under stormy conditions. Boats anchored a fair distance from the rushing water. We went across the street to a coffee shop and had yummy chili and cornbread and a latte. Perfect! Then relaxed in our funky, old-fashioned room and read. Good way to spend a rainy day. That evening while we were looking at our bag of crushed potato chips and the one energy bar, a couple we had met at the ferry terminal looked in the window in our door and waved a bag. They said nothing was open but a dive down the street and they had just made it to the grocery store before it closed. So they asked if we wanted to join them for dinner. They also bought mustard and wine and a six-pack of beer. We picked up our bag of crushed chips and joined them. They had a kitchen unit; we did not. They shared the six-pack, and we had the wine. And we all enjoyed the baloney sandwiches. Reminded me of what I used to eat in grade school. We sat up past 10 talking. Found out he was a retired engineer and interested in my bridge books. So gave him my card. Who knew! The refrigerator, only inches from Edna’s bed, was noisy and kept her awake. Since we couldn’t figure out how to turn it off, we unplugged it. Edna slept well, but it created a problem! In the morning, the floor was all wet because the freezer defrosted during the night. So we had to use some towels for cleanup. Fortunately, the only room service we had during our stay was an older lady delivering us some new towels that morning. Some things just work out. 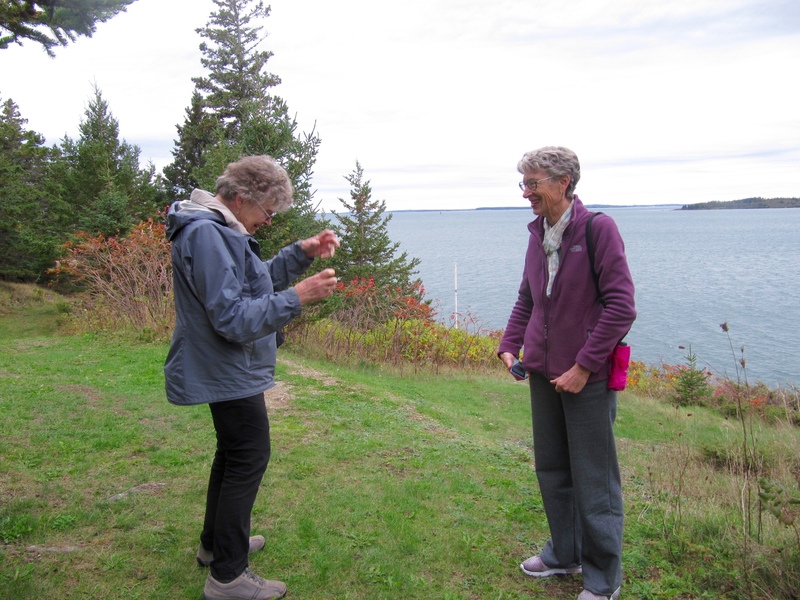 Judy and Edna on Vinalhaven, Photo taken by Jeanne, the taxi driver. The motel’s small lobby had few choices for comp breakfast. That was okay, we were hungry. We took our food back to our room and ate. It was not raining, so we explored the town. We walked along the main street and up the hill past a library that was closed and along several streets in a residential section. We walked back through town to the coffee shop to warm up. It was quite cold. I had a latte and Edna hot chocolate, and we ordered chicken sandwiches to take to our room and eat later. 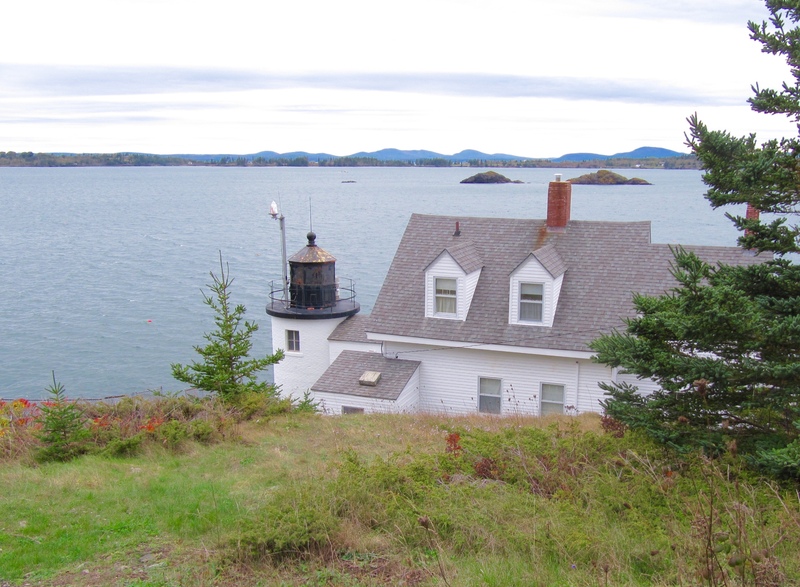 Brown’s Head Lighthouse on Vinalhaven Island. Holly, the proprietor, noticed that we had returned after being there the day before. She asked us where we were from and what brought us to Maine. When I said lighthouses, she asked if we had seen Brown’s Head, Vinalhaven’s lighthouse. We didn’t know there was a lighthouse on the island. When she found out we didn’t have a car, she called her friend Jeanne who could take us there. And some fishermen at another table started telling us about fishing for lobster. Of course, I had to talk about Oregon’s Dungeness crab. We had quite a conversation going when the sandwiches were ready. By the time we got the sandwiches in the fridge that we had turned back on, Jeanne was there to take us to the lighthouse. Jeanne, as it turned out, was the island’s taxi service. You could spot her car. It was the one with the lobster buoy bungee corded to the top and a sign on each side saying “Taxi” stuck on with duct tape. It totally fit Vinalhaven Island. The State Beach on Vinalhaven had no sand, but you could see islands offshore. Jeanne took us to Brown’s Head light, a state beach, past several quarries, and gave a running commentary on the history of the island. Then she dropped us off at the museum at our request. And when we went to pay her, she said that she had already been paid by Holly and the fishermen at the coffee shop. After calling Jeanne, Holly felt quilty that maybe we didn’t really want a taxi ride. So she and the fishermen took up a collection to pay the fare. It is one of our favorite memories of the trip. The museum was not actually open when we were dropped off, but the door was unlocked, so we went in. We called out, and a lady came from the back. She said they were not open, but having a committee meeting. She turned on the lights and said we could look around –just turn off the lights when we leave.That was so typical of Vinalhaven. The museum was very interesting and made a lot of sense, after our tour of the island. Vinalhaven’s quarries were a major source of granite for many large buildings and other structures in New York City and throughout the Northeast. That evening we went to the dive, since it was the only place open in town. It wasn’t so bad—just a restaurant and bar filled with locals. Evidently, on Friday nights, there are team competitions of groups of questions. Some were local knowledge, but the ones that were more general, we joined in. We didn’t actually write them down and turn them in, but we tried to come up with the answers along with everyone else. One was, “Can you name the top 20 words that Trump uses?” We came up with quite a list, of which many were among the winners. The food wasn’t bad, and we had a good time. Then we walked back to our motel. The next morning we would be leaving Vinalhaven. We had enjoyed the whole experience there. What a step back in time! We loved our stay in the Maine Beaches Region on the south coast of Maine. Except for the first day when it rained, the weather was lovely. On this section of the trip, the weather was sunny on some days and others were overcast but no rain. We got up early and packed and enjoyed our last of the great comp breakfasts at The Milestone. 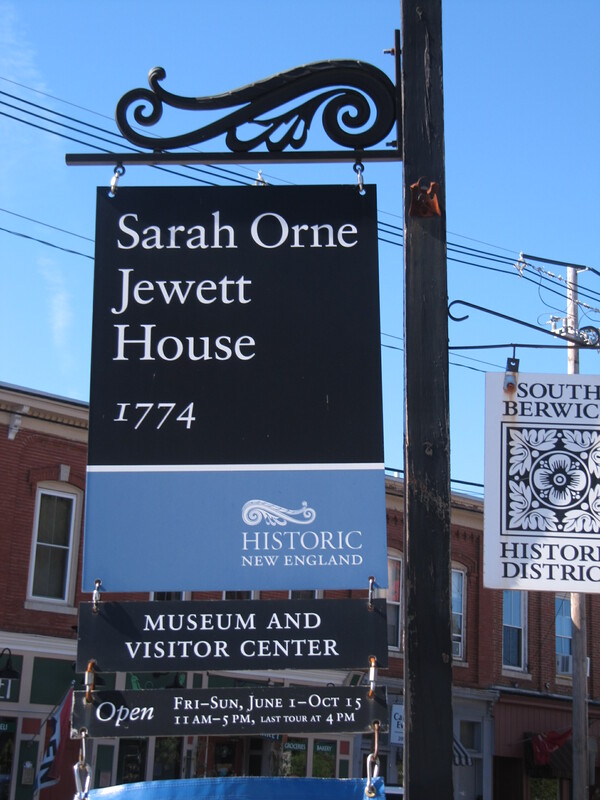 We were off to South Berwick to go through the Sarah Orne Jewett museum. We got their early and parked right out in front and sat in the car and read. Nothing was open when we first arrived. Besides, it was cold. Next door to the original Jewett home, this is the visitor center within another Jewett home on the same property. The wait was worth it. There were a few other visitors, and the guide took us on a very thorough trip through the house where Jewett was born and lived most of her life. Nearly everything in the house was original. We saw the desk that she wrote at. Her shelves with the items she treasured as a child and as an adult. It was really a step back in history. The Jewett family was well off, and Sarah traveled in circles that included the rich and famous. This also included the most famous writers of the time, such as Ralph Waldo Emerson. Sarah lived between 1849 and 1909. We had lunch in the same café where we had eaten on our first day in Maine. Then we headed back to Hwy 1 and up the coast to South Portland. We traveled the same route as the day before when we were searching for the Portland Head Lghthouse. In fact, the motel was only about half a mile farther up the highway from where we turned to the lighthouse. When we got to the motel, they had us booked in a room with a king-size bed. Not what we had reserved. So no way! Edna sometimes awakens and reads during the night, and I have restless legs and need to be able to kick to my heart’s content. Of course, there were no rooms available with two beds of any size. So we asked for a cot. They said that it might not fit because the king rooms were small. We told them we would make it fit. Edna sits on the king-size bed in our room of nearly wall-to-wall beds. We made it work. And we did, but there wasn’t an inch to spare. It was the largest cot I had ever seen–the size of a twin bed. We had to rearrange much of the furniture and ended up with a solid bed look to the room. But we were happy. Not so with the dinner next door at the Maine Table–only bad meal on the trip. The breakfast room had a good selection but had the feel of a large, crowded restaurant with everyone constantly moving to and from the buffet tables. South Portland has a city feel, and folks seemed busy, busy.. We missed the cozy, friendliness of The Milestone, where everyone was from somewhere else. We headed north on Hwy 1, which turned into 1A and there were so many signs, it was confusing. We made it into Portland and into a parking lot, where it was $8 for two hours. We found another spot before the two hours were up and moved the car. It was on the street and had a frustrating meter. We got so discombobulated that we didn’t grab the ticket and put on our car’s dash. But the fellow behind us, waiting to use the meter, tracked us down and handed us our ticket. We were thankful and felt a bit stupid. So we walked back to the car and placed it on the dash. You’d think we’d never been in a city before. And Portland, ME, is a whole lot smaller than Portland, OR. 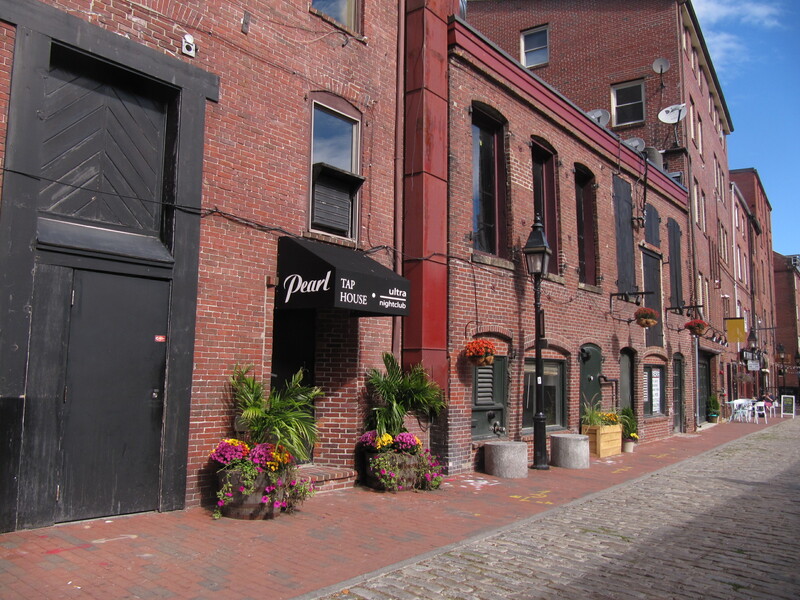 Lots of brick in Portland’s Old Port District and lots of charming shops. We had hoped to go on a city tour on a fire truck, but like with many things, it didn’t run after Labor Day. But we did get to browse Portland’s Old Port District. It is very touristy with many shops. We did some shopping, and I got such big-ticket items as refrigerator magnets, post cards, Christmas ornaments (the only thing I collect), and some great kitchen towels. We then returned to the car and drove in circles trying to get from the Port District to the Portland Art Museum–lots of one-way streets. We finally found it. Then we had to find parking. It was definitely worthwhile with a number of Winslow Homer’s and Edward Hopper’s and other paintings with familiar artist names, all displayed beautifully. We even had lunch there. I had lobster bisque. Quite good. Then back to South Portland and our motel. I napped and Edna read. For dinner, we headed south on Hwy 1 to more familiar territory. We didn’t want to get lost in the big city or eat where we had been the night before. Down the road we found Romeo’s Pizza. It was very good. We even saved a couple of pieces for the next day. We navigated breakfast once again in the crowded breakfast room and then packed up and were on the road by 9:30 a.m. Not sad to leave the BW Merry Manor. We took the turnpike to Brunswick and split off on Hwy 1. We stopped at a rest stop/Info Center and stocked up on info on every place left on our itinerary. Had long chat with fellow who worked there. Love talking to locals. Easy trip to Booth Bay Harbor. This is the Mid-Coast Region where the peninsulas are long with long inlets and many offshore islands. You never quite see the ocean on this part of the coast without going through a great deal of effort. 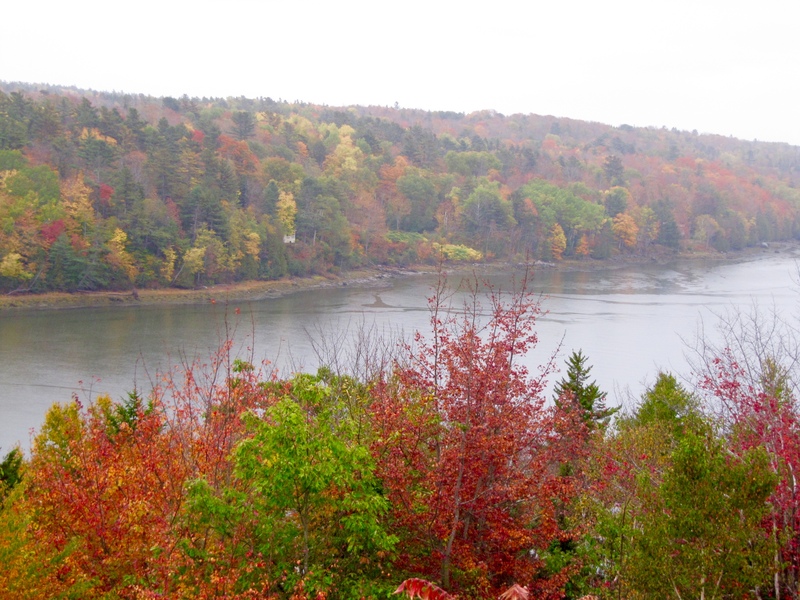 You do see lakes and inlets and we continued to see beautiful fall color. Booth Bay Harbor was a delightful town in a hilly setting at the end of a peninsula. Our motel, Beach Cove Inn, was out of town and overlooked a lovely lake. The room was spacious with two beds. We even had a balcony. If we had needed to fit in a cot, we had room for half a dozen. We loved all the space, but could have used a couple of chairs and a bigger table. We brought in chairs from the balcony and crowded around a tiny table with a lamp when we were eating our leftover pizza. We drove into Booth Bay Harbor and browsed the town. Again bought a few things. It was a charming town, but crowded with end of season tourists. We had dinner at a tapas place, sharing a few small plates of food. Back at our motel, we discovered a TV series that we liked—Northwest Forest Law. The first few programs took place in New Hampshire and later ones in Maine. All were the real deal, involving off-road vehicle problems and poaching in the forests or on the sea. The officers bent over backwards to give people a second chance, but when they faced really bad guys, they wrote them up for the maximum or hauled them off to jail. 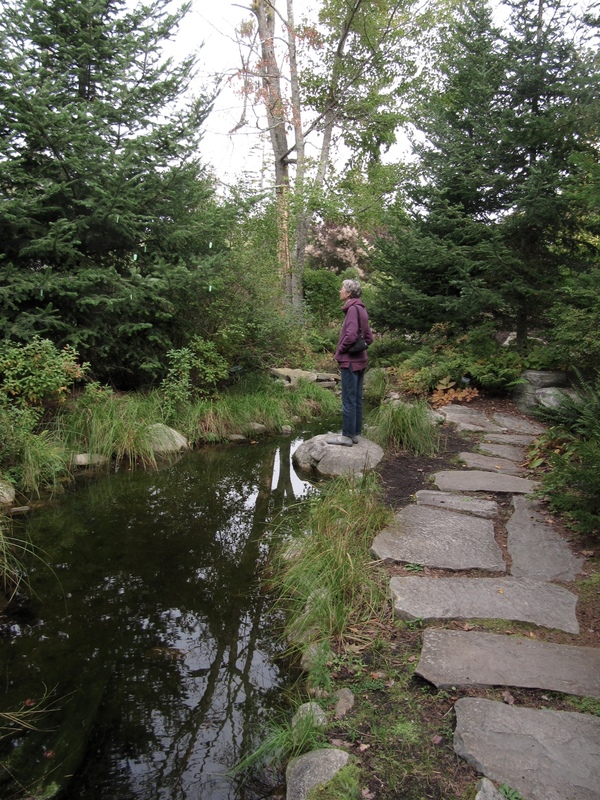 The Coastal Maine Botanical Gardens were lovely even though the flowering plants; bloom was over. 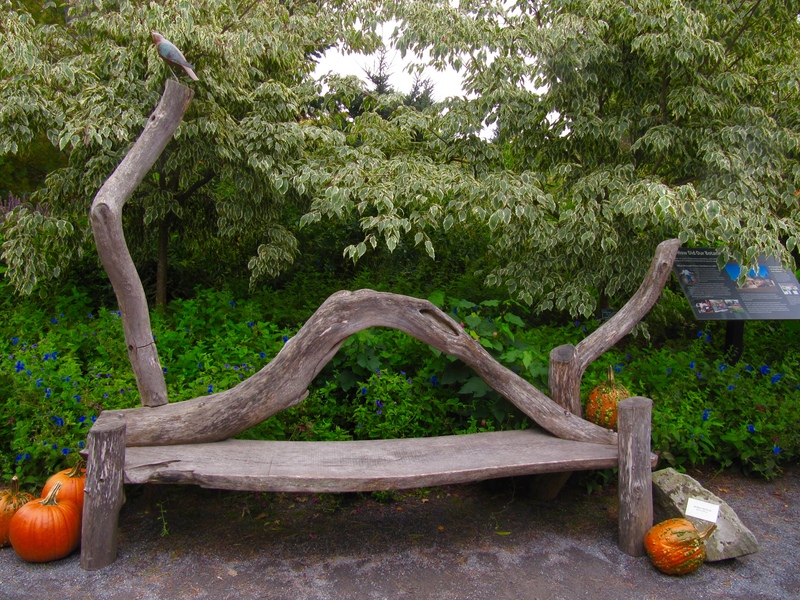 Love Robin’s bench at the garden. Look carefully for the robin upper left. It was a bit of a drive, on small country roads, but we found the gardens. 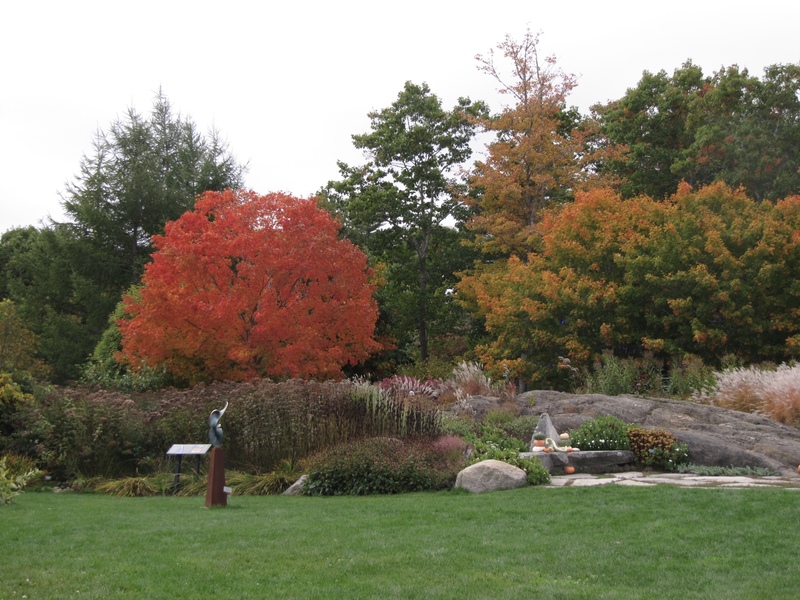 The flowering plants were past their peak, but the perennials and trees were just fine. It had several gardens with well laid out paths. But it was so cold, we were shivering. So we headed for a deli within the headquarters building. We had coffee to warm up and some cookies. Lovely areas to explore throughout the gardens. When we ventured out again, it didn’t seem so cold. We roamed around for a couple of hours, taking in many gardens. We took photos and had a great time. The gardens were wonderful. Then we found a lovely building with a restaurant and had lunch. We left there and browsed nearby peninsulas.The roads were narrow and winding and signs were limited and we got lost more than once. But we enjoyed all the tree color and the many small towns that were not filled with tourists. We ended up at Hendrick’s Head Lighthouse. Many lighthouses are now privately owned, as was this one. So we couldn’t get too close. Hendrick’s Head Lighthouse was located on one of the many peninsulas in the Mid-Coast Region. That evening, we had dinner at Kahlers, one of few places we found open. It was very crowded, and we had to wait But it was worth it. I had a lobster roll in my quest to eat all things lobster. I had seen signs for it everywhere, but wasn’t sure what it was. A lobster roll consists of large chunks of lobster in a light mayo dressing with grilled bread bent upward so nothing falls out. I loved it! Another chance to eat lobster! Back at our motel, we watched more Northwest Forest Law—still New Hampshire. We got so we recognized some of the officers. We found out the next morning that this was the last night for this motel to be open and same for Kahlers. We have loved our stay here at this motel and in Booth Bay Harbor area. Tomorrow we head to Rockland still in the mid-coast region. Mainers love a good pun. Every town had a Mainely Pizza or Mainely Lobster or some other variation and often a Maine Street in the middle of town. I felt right at home with Oregon type drizzle and showers throughout the first day and temps in the 50s most of the trip. 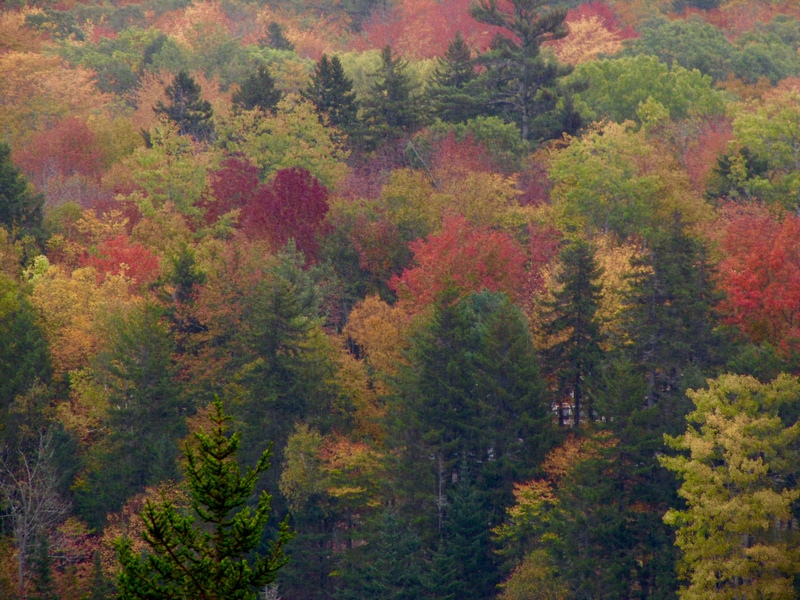 The displays of tree color throughout the 2 ½ weeks of our trip were fabulous—even in the rain! The best displays were along the turnpike with no places to pull over and take photos. So, unfortunately, we didn’t get many photos. The trees were beautiful throughout the trip. This photo was taken in the rain. The Oregon coast is noted for moderate temps all year, but not so the Maine coast. The summers can be hot and the winters cold and snowy. Because of the cold winters, in the coastal towns that depend on tourists, businesses, such as lodgings, many restaurants, and tourist hot spots, close around mid-October to November 1, and don’t reopen until spring. The coast of Oregon is bordered mostly by Hwy 101 with nearly all the coast public. 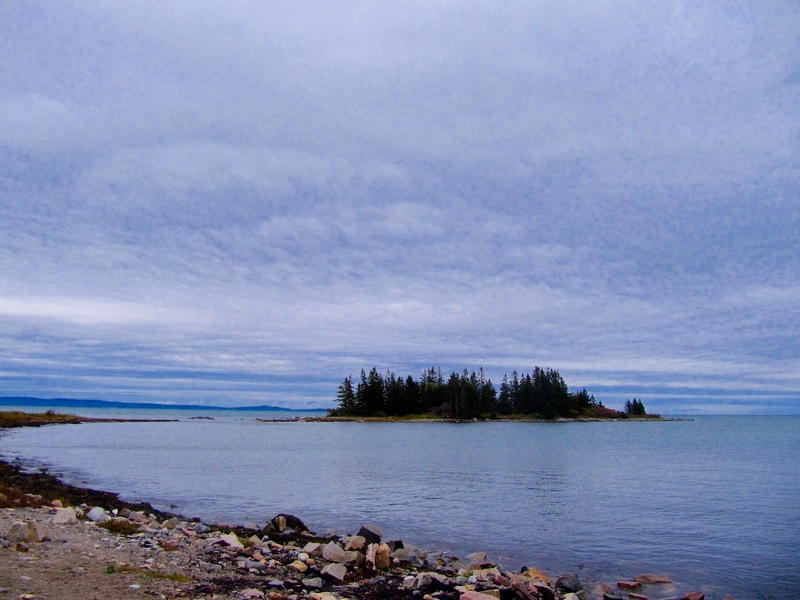 The coast of Maine is mostly private with some public parks like Acadia National Park. But the fact that really blew me away was that while our coast is 363-miles in length, the coast of Maine is 3,500 miles in length. Using a ruler on a map, they are identical. South of Portland, it is basically straight with sandy beaches more like Oregon, but north of Portland, there are long inlets and big peninsulas and numerous offshore islands. These islands tend to break up the waves. We saw no big wave action and only rocky shorelines on this mid-section of Maine’s coast. And the rock was all granite—no basalt or sandstone, as on the Oregon coast. 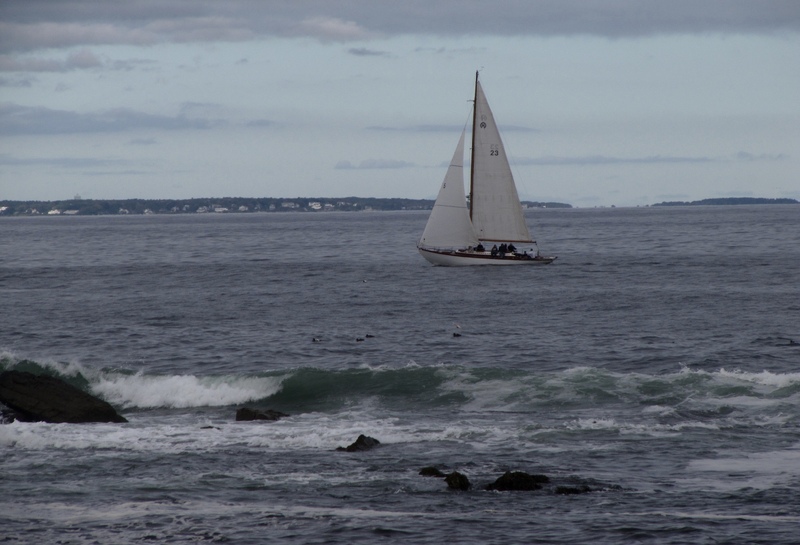 To me this was the classic Maine coast with the sail boat. My sister, Edna, and I planned our trip last May and booked flights and all lodgings at that time. The good was that we had reservations wherever we went. The bad, we discovered over and over, was that problems sometimes occur when there are third or even fourth parties involved. The flights were fine. But we learned an important lesson—never, never fly Basic Economy. Economy now has two levels—Basic and Standard. The cheapest level, Basic, allows only one carry-on (purses count) and on full flights, you get the middle seat and don’t get to sit with your travel companion, plus the usual scrunched seat situation. We survived it, but never again. We were asked over and over why the coast of Maine. Well, Edna has wanted to go there since she first read “The Country of Pointed Firs” by Sarah Orne Jewett many years ago and she always wanted to stay on an island. 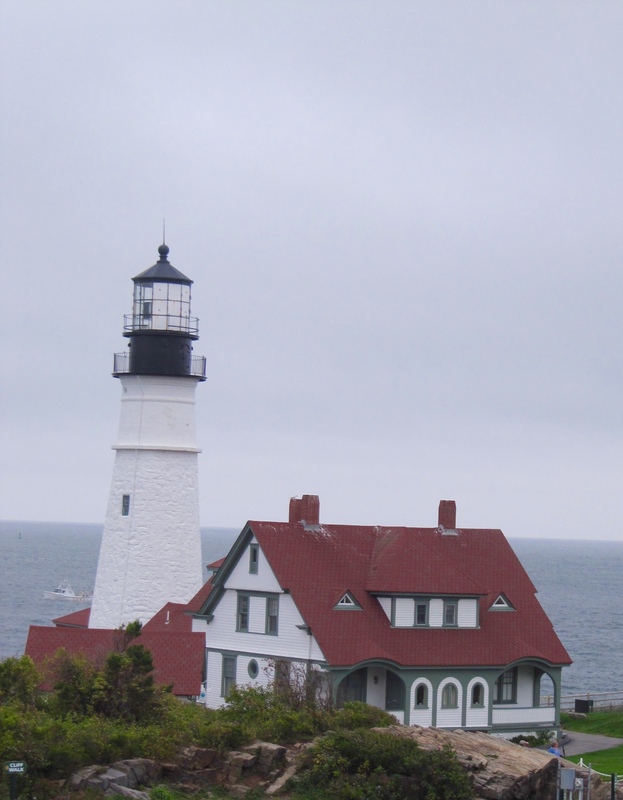 I wanted to eat lobster and see lighthouses as well as compare the coast of Maine to the coast of Oregon. We each got what we wanted. “Where are you?” asked Edna as I was turning into the Portland, OR, airport about 7:30 p.m. and thought I saw an off ramp for long-term parking. I was running late and she had been at United check-in for at least an hour, but couldn’t get any farther without me, since my name was on the tickets. I told her I was just arriving, and it wouldn’t be long. But I was wrong! I pulled into short term parking accidentally and then had to back out with a big bus behind me that also had to back up. Then I pulled a U-turn and went out of there going the wrong way. I made my way back to the freeway, I-205, and tried again. Got all the way around and didn’t see any signs for long-term parking. So somehow got on Killingworth and heading into not-so-good Portland neighborhood. Pulled a U-tern and got back to freeway and to airport and this time saw a sign with a P within a circle, must mean parking, only it was four lanes over on the fast-lane side, which I could not get to. So I made my way all around again without getting lost, and this time took the off ramp into a parking garage that had a section for long-term parking. Whew! Just a little stressed by this point. I got parked, noted my spot, safely tucked the ticket in my purse, grabbed my two tow-along suitcases, and took an elevator down to “tunnel to terminal.” I didn’t realize Portland had only one terminal until I asked someone with a uniform which terminal the tunnel was headed to. He gave me that look, and said that there was only one. Now I know. The tunnel went forever, but had a people conveyor belt, which really helped. I got to the United check-in and didn’t see Edna, but a very friendly employee helped me through the auto check-in. Then I headed through security to the gate. I didn’t see Edna in either place. As soon as I got seated, my phone rang. “Where are you?” She was still at check in and super stressed by this point. She said that she did wander off every little while to stretch her legs, which must be how she missed me. Since I couldn’t go back through security, she attempted checking in again. This time, she made it. The same friendly employee helped her. He told her, “Your sister was just here a few minutes ago.” and checked her through. So we finally caught up with each other—both a bit stressed. Since there wasn’t time to eat dinner, I pulled out two lunches from my backpack that I thought we might need in the middle of the night. (Good thing I always carry food.) As soon as we finished eating, the 9:45 p.m. flight started boarding. Since it was an overnight flight and not full, we were seated in a three-seat section with an empty seat. We still couldn’t get comfy enough to really sleep, but we dozed a bit. The pilot didn’t help. From time to time, he’d say something like, “Seatbelt sign is on, please return to your seats.” accompanied by loud static. It was the middle of the night; nobody was wandering around. Everyone was trying to sleep! Arrived in Newark, NJ, about 5 a.m. Layover was a couple of hours. We had a pathetic breakfast, sort of like an Egg McMuffin turned to cardboard. The latte I had was good and helped wake me. The short flight to Portland, ME, was easy. I loved the idea of flying from Portland to Portland. The Portland, ME, airport is considerably smaller than the Portland, OR, airport. Within a short time, we were at the car rental area and settling into a quite new Nissan Sentra. This car had push button start. Didn’t need the key, but it had to be within the car. It always seemed like magic when the car started up. Both my sister and I are GPS challenged. So a few weeks before the trip, I went on Mapquest and ran off maps and directions from all of our destinations to the next one. And numbered them and stapled them to our Itinerary that we had created last May. I was concerned that being awake most of the night, being in a place I had never been, and driving a car I had never driven before might not be such a good idea. But I was okay; the latte had awakened me. It was raining, but even so the trees were lovely and the turnpike was well marked and went through no towns and was free of all debris. Maybe paying a toll isn’t such a bad idea. It was only $1, and not all sections were covered by toll. 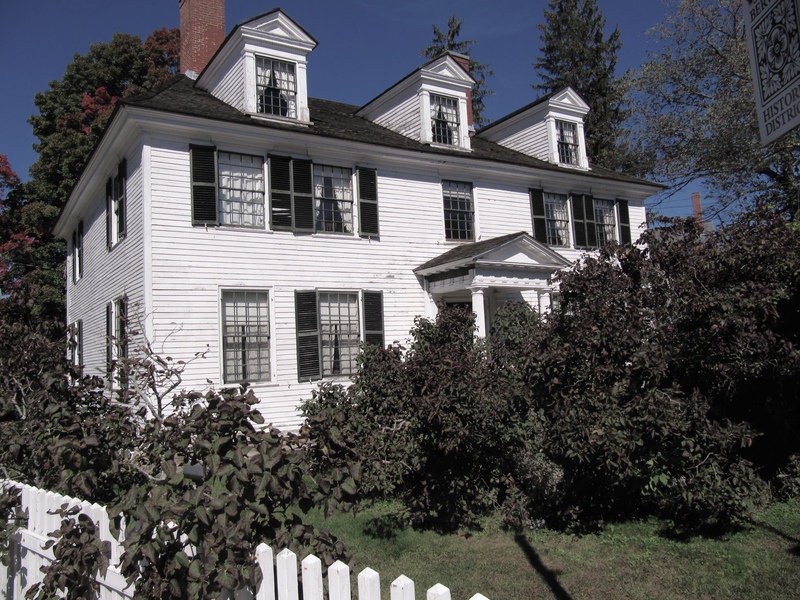 The Sarah Orne Jewett home and museum–not open until later in the week. We followed map #1 and turned off at the off ramp to take us to South Berwick, so we could see the Sarah Orne Jewett home and museum. When we got there, it was closed and wouldn’t open until 11 a.m. Friday. That was the day we planned to leave the southern beaches and head to the Portland area. So we had to reschedule our second and fifth days within the first hours of being in Maine. We followed our directions to Ogonquit and found the Milestone Motel. It has lovely grounds and nice rooms. They allowed us to check in early, and we crashed for three hours. Then got up and studied the regional map for the area to find a restaurant. I was hoping to have lobster. We had lobster all right, and it was the best meal of the entire trip. It was a lobster place out on a spit that we found in the pouring rain. 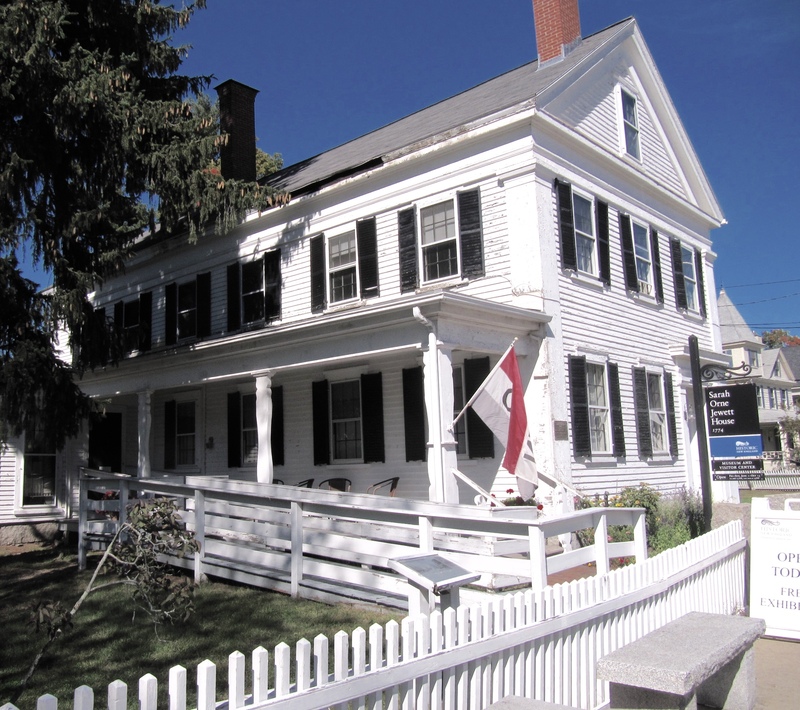 We each had a whole lobster, corn on the cob, steamed clams, and blueberry pie––the quintessential Maine dinner. We were full and happy. Then we went back to our motel, watched an hour or so of TV, and turned in early. We slept and didn’t wake until almost 8 a.m. the next morning. The rain had stopped, and it was overcast. We explored Ogonquit and loved the stately old Colonial homes lining the roads in the area. We saw the Atlantic Ocean and stopped for awhile. First view of Atlantic Ocean south of Ogonquit. Largest waves we saw. Then found a sign to Nubble Lighthouse. The road wandered through a rather new section of homes, just a neighborhood street with no traffic. We were surprised when it came out at Nubble Lighthouse. We were also surprised to see lots of people there. It was undergoing renovation, so was surrounded by scaffolding. We still took photos.In the distance, we saw Boon Island Lighthouse on a tiny rocky ledge. 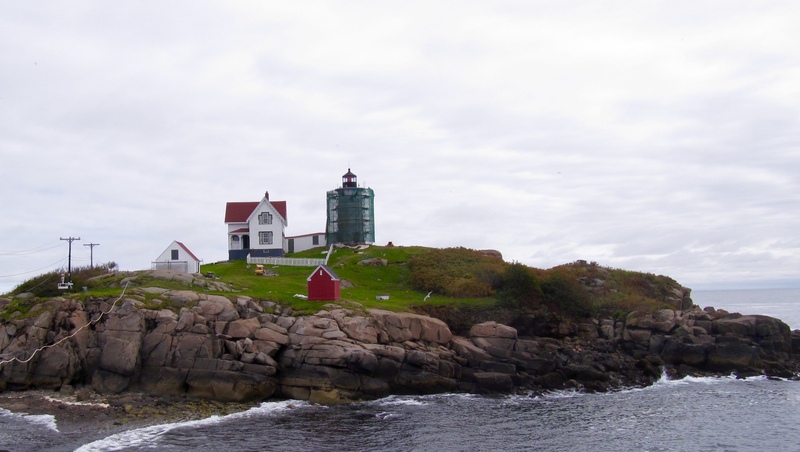 Nubble Lighthouse, on an island, was undergoing renovation. There were good ocean views on this stretch of coast. We checked out the village of York and then on the way back to Ogonquit, stopped at the Ogonquit Museum of Art. It had interesting exhibits and a lovely setting on the cliffs overlooking the ocean. It had lovely grounds, which was also a sculpture garden. We talked to the gardener, who was very proud of the grounds. The Ogonquit Museum of Art had lovely grounds with numerous sculptures. We headed back to Ogonquit and browsed the town, and stopped at a bakery for tea and treat. I had Boston Cream Pie, which I hadn’t had in many years. It was huge, actually more than I could eat. We went back to the motel and napped. Then we went out to eat. The town center was so crowded, that the first restaurant with parking was where we ended up. It was Italian and wonderful. It was a much smaller dinner this second night. We shared some appetizer plates and each of us had caprese salad and a glass of wine. Again got to bed early. We enjoyed our day in the southern beaches region. It was a good comp breakfast each day at the motel. On this mostly sunny day, we headed north of Ogonquit on Hwy 1, parts of which we had driven from South Berwick to Ogonquit. 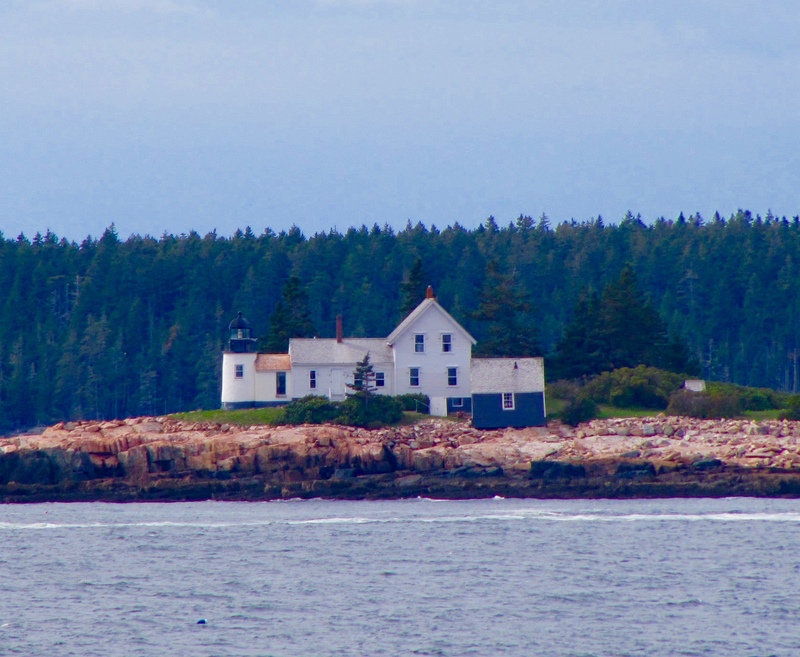 In trying to find the town of Port Elizaabeth and the Portland Head Lighthouse, it turned out to be an all-day adventure, even though we had a regional map. We kept heading north on Hwy 1, Maine’s coast highway, expecting to see signs at any moment, but not seeing any. There were no stretches of ocean views, but there were places to turn to the occasional public beach. With speed limits mostly between 35 and 45, this was definitely not the turnpike. We drove nearly to South Portland. Portland Head Lighthouse is probably the best known lighthouse in Maine. We stopped at a deli for lunch. Two old-timers seated next to us were playing dominoes. When one headed to the restroom, I asked the other how to find Portland Head lighthouse. He said another half mile or so farther north and to turn at a certain road. We did. Again, no signs to Cape Elizabeth or lighthouse. But when we got there, there was a huge crowd, even tour buses. Somehow they knew how to get there. This is an impressive lighthouse and keepers’ house. 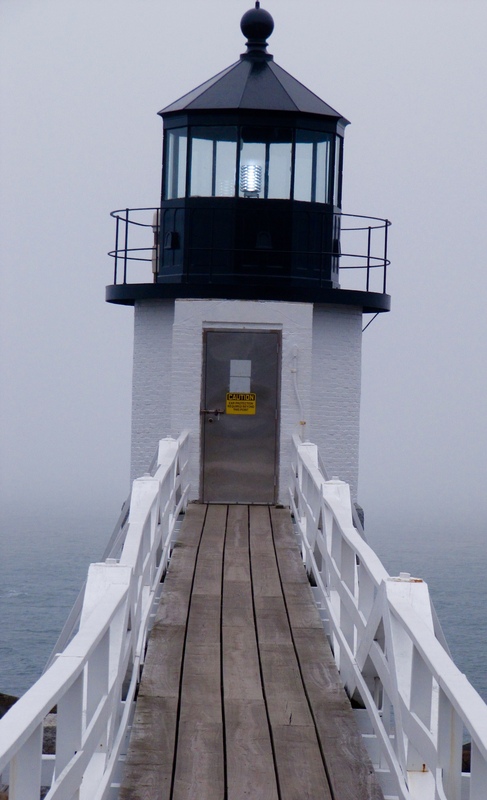 The long trip to find it was worth it, the lighthouse museum covered different types of Maine lighthouses and the different kinds of lights, such as the Fresnel lenses that are used in many Oregon lighthouses. It was very interesting. Dig this! This lighthouse was commissioned by none other than George Washington! A bit of history here. We walked around the base of the lighthouse and took several photos of it and the keeper’s house and also saw in the distance the nearby Ram Island Ledge Lighthouse. Then we went to the gift shop where I bought a book about Maine’s lighthouses. Ram Island Ledge Lighthouse built in 1905 of granite. 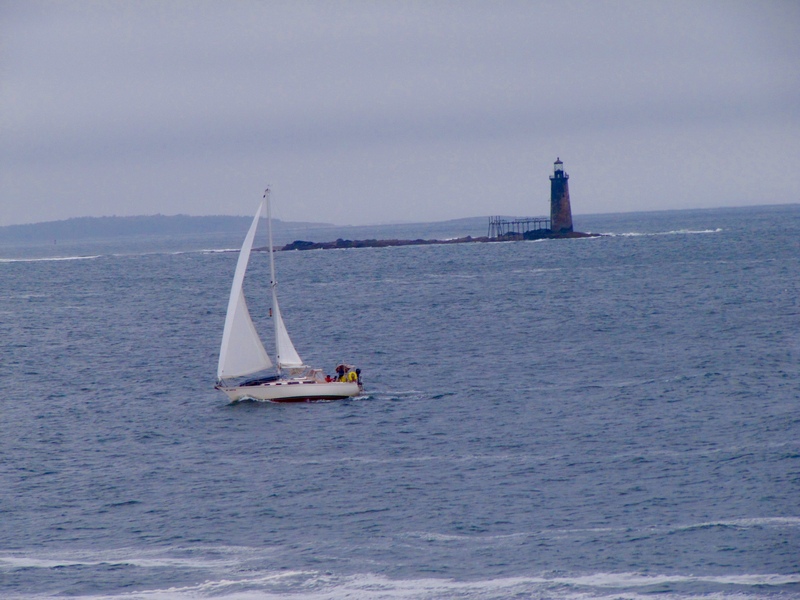 Visible from Portland Head Lighthouse. We came back to Ogonquit and had dinner at Anthony’s. We had fish chowder, bread, wine. That just hit the spot. We stayed up later, so we were adjusting to the jet lag. The next day we would be heading to the Portland area to spend a couple of days. #223 Where has the summer gone . . . Between finishing my new book, marketing my other books, responsibilities at Backstreet Gallery, and preparation for the 8th Annual Florence Festival of Books, it was a busy summer. I had hoped to restart my blog in May when I returned from California, but that did not happen. Now the new book is at the printer, marketing my other books has slowed down with the tourist season over, and the FFOB for 2019 won’t start until next April. That leaves Backstreet, which is not a problem when the others are not consuming most of my time. So I’m hoping to get back on track of posting a blog each Friday. 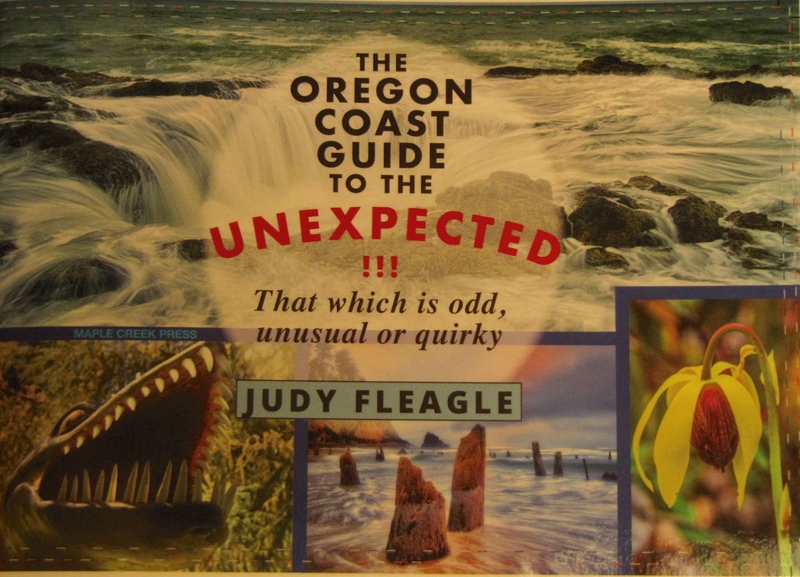 My new book, The Oregon Coast Guide to the UNEXPECTED, that which is odd, unusual or quirky covers 26 locales that were unexpected when I actually saw them. The kind of place you would say, “Who’d a thunk it!” or “What the hell!” During my 21 years as an editor/staff writer for Oregon Coast magazine, these were the locales that were the most unexpected. They cover the entire coat, ranging from Astoria to two miles this side of the California state line. When I first got this idea two years ago, I mentioned it to my publisher, Bob Serra, who did not discourage me. I started with a list of 35. I had to delete some because they were no longer what they once were or no longer existed or those in charge didn’t want certain facts included or I could not come up with appropriate photos. All places in the book were visited and researched either in 2017 or 2018 and all photos are recent and of high resolution. There are no haunted places, no ghosts; everything can actually be seen by anyone. Some are only visible at high tide and one at extremely low tide. Some are man made and others created by nature or demonstrate nature in action. Although I finished the writing by the first of March this year and the fact checking by mid-April and turned it over to Bob for editing, that was not the end of my participation. Last May, when I got back from California, I started on the search for photos. I had mentioned that I needed them by the end of May to all who were doing the fact checking on the 26 stories in hopes that the book could be out by the end of summer. Silly me! By the end of May I had the ones I had taken and very few others. In my hunt for photos, I dealt with numerous volunteers at museums and public entities, a whole town after writing a letter to the editor requesting photos, various ranks of the Coast Guard, and rangers at the BLM, three different state parks, one national park, and two forest service entities as well as numerous businesses and lots of somebodies who knew somebody who knew somebody with photos. And, yes, I went up and down the coast taking photos and so did Bob. And, yes, I went online and found some but only one actually worked out and that was from Wikimedia Commons. Some stories had three different sources for three photos. One of the problems was that Bob would only use good quality, high-resolution photos, and many of the photos submitted looked great, but were low resolution. When asked to submit in high resolution, it wasn’t possible, and therefore those photos were unusable. It took until the end of September to get 85 good quality, high resolution photos for the 26 stories. We ended up using 26 photos that I took, 15 by Bob, and I paid for 15 from professional photographers. I could write a book about just the trials and tribulations of acquiring the photos I needed. One of the UNEXPECTED places in the new book. Hint–it’s on the North Coast. During the summer I also did much of the front and back pages stuff like the introduction and table of contents and wrote the back cover and Bob designed the cover. By the first of September, we had enough photos that I could write captions and photo credits and Bob could design the stories. Then the last few came in. Whew! The book went to the printer October 5, and we received the proof copy about two weeks ago. In about another two weeks 1,500 copies should arrive. So after all our hard work, The Oregon Coast Guide to the UNEXPECTED, that which is odd, unusual or quirky! will soon be available. Guides do well and so do books about the weird and odd. Since this is a guide to the odd . . . I think it will do well. I already have 105 names and emails of folks who want to be notified when the book is out and very few of them are from Florence. I’ll notify these folks and put a press release in the newspaper here in Florence when the books actually arrive. Giving a bridges PowerPoint program at an RV park south of Florence.. I enjoy being a part of a community of artists of which some are also writers. I’m actually the only writer there that is not also an artist. So I always tell visitors not to ask me to draw anything! I really enjoy being on duty and meeting folks from all over the country visiting the Oregon coast. And my books sell there—especially when I’m on duty. We worked hard all summer. In June, it was getting word out to potential participating authors and lining up sponsors, In July and early August, it was accepting applications, sending out information, and answering questions from the 80+ authors and publishers who signed up. 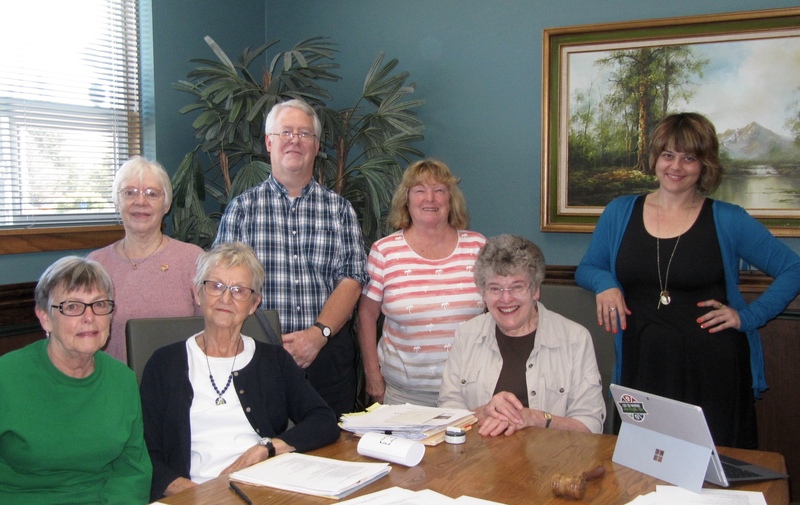 August and September were busy with organizing Friday’s activities––the afternoon panel discussion and the evening Meet ‘n Greet and Keynote Speaker––, arranging the caterers for both Friday and Saturday, and designing posters and flyers and having them printed. I was particularly busy distributing posters and flyers to towns and cities outside of Florence, arranging ads, writing press releases, and articles during those two months. Recording radio spots and interviews also took time. It takes a lot to put on an event and having it run smoothly with no glitches. I think it was the best one ever. So all the work was worth it. On Friday evening, we had a terrific Keynote Speaker—New York Times bestselling author Amy Stewart. Her Kopp sisters’ books are great fun and based on the true life story of Constance Kopp, one of the first female deputy sheriffs in the country. Stewart gave a very entertaining talk. I was impressed with her rigorous research and fact checking. 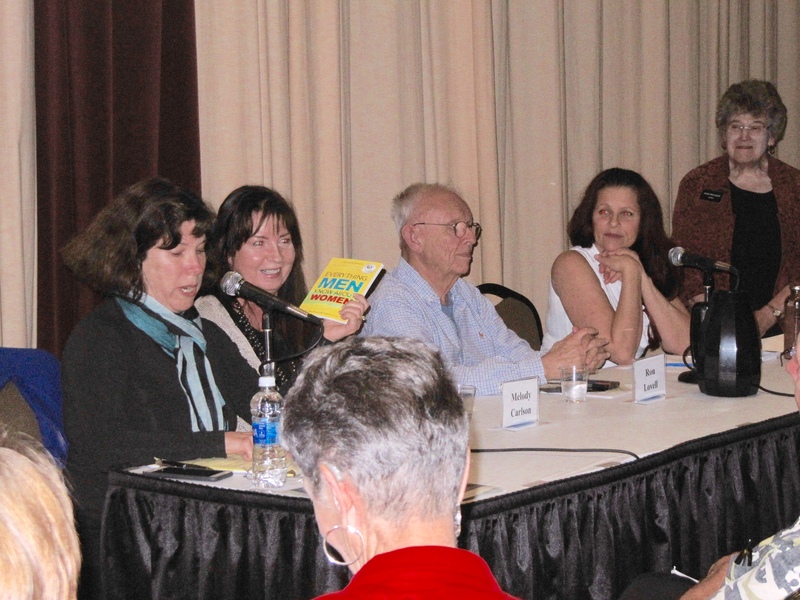 On Friday afternoon, we had a dynamite panel of four authors who spoke and answered questions regarding marketing. Cindy Cashman, marketed her book, Everythingt Men Know About Women, in 1995 and it catapulted her to being one of the most successful self-published authors ever—and it was blank! So it was all about marketing. Cashman thinks out of the box. 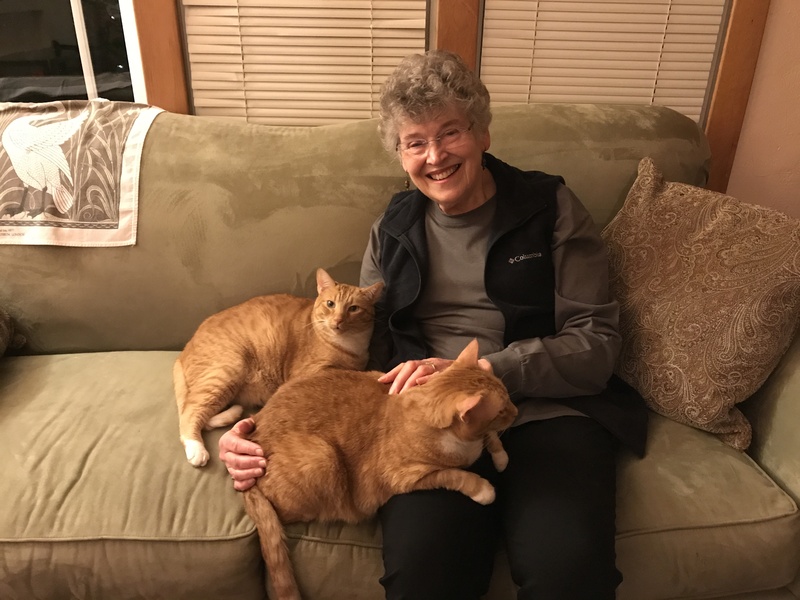 Melody Carlson, from Central Oregon, has written more than 200 books for various age groups and many are romances. She has sold more than seven million copies of her books and goes through a traditional publisher. She is one of the most prolific authors in America. Ron Lovell, a past university professor who taught many years in the journalism department at OSU, has written 14 books since retiring that are in the mystery genre and many take place on the coast. Then there is Tracy Markley, a personal trainer, who has written three books about fitness for seniors and stroke victims. Although relatively new to the writing game, Tracy uses every conceivable way to market her books. These four panelists offered quite a variety of ideas for marketing. Marketing panel (l eo r) Cindy Cashman, Melody Carlson, Ron Lovell, and Tracy Markley and the moderator, me, perched on a nearby stool..
At the book festival on Saturday, all but one of the panelists participated selling their books at their own tables and the fourth one was there chatting with participating authors. And Amy Stewart was there for a while. Among well-known authors participating—Bob Welch and Bill Sullivan were there along with 73 other authors and seven publishers. I chatted with many participating authors and bought seven books and traded one. A few, I’ll give as Christmas gifts. I’m pleased to report that I sold more than I bought and got 14 more sign-ups for my new book. Both participants and attendees seemed to have a good time. So once again, it was a successful event. As soon as the Festival was over on September 29, I had to finish preparing for a trip to the state of Maine with my sister. We were leaving October 1 for a two and half week trip. What a hoot to fly from Portland, OR, to Portland, ME. So my next three blog posts will cover the Maine trip. It was Mainely terrific––typical Maine humor! #222–Nothing like a deadline . . .
Last Friday I put in an impossibly long day, only possible because I have a deadline, Friday 13 (no less) to get my edit in for my new book—The Oregon Coast Guide to the UNEXPECTED, see the unusual, odd, and quirky. I got up at 4 a.m. and hit the road by 6:30 a.m., a time I’m usually just getting up. It was still mostly dark, drizzly, and foggy—especially on headlands. Only traffic was in the towns. Actually, this was my first stop in Waldport for a latte. The purpose of this trip was to finish up factchecking. Although the edit is due right away, I won’t need the photos until the end of May. But I’m getting them figured out. Some I’ll take, some I’ll obtain from businesses or public entities, some I’ll buy, and some my publisher will take. First stop, Abe in Lincoln City. I intended to only photograph the plaque at the base of the statue. So it didn’t matter if it was raining. But I noticed that everything around Abe had changed, so I would have to take photos. There was new fencing, new pavers, and new landscaping that wasn’t even complete yet. Because of the rain Old Abe had a slate-colored patina. I may have to come back. All the plantings were gone and new everything around the sculpture. Next stop, Neskowin ghost forest. It’s only possible to see these petrified stumps at minus tides in the winter, but I wanted to get a shot of what the area looks like most of the year. I lucked out, the rainy drizzle had stopped and fog was lifting. And the tide was out just enough for me to skinny around the poiut without getting my feet wet in Slab Creek. I had concerns also about my legs and if I would be able to get around on beaches. I was able to as long as I watched my step and didn’t try to go too fast. It was beautiful and I got a great shot of the beach where the stumps appear and of Proposal Rock. I felt really good. On to Hug Point, just south of Cannon Beach. It takes 3 1/2 to four hours to get from Florence to Cannon Beach. When I got there, the fog was still hanging around, but with sun breaks. I was amazed at all the people. Apparently, it was spring break in Washington and they all headed to the Oregon Coast. I stopped to get photos of the waterfall and stagecoach road that hugs the rocky headland. But my first photos were of the adorable, unafraid black bunnies near the parking area. I wasn’t the only one taking their pictures. The waterfall was at its best with the rain we’ve had lately. And I got a great shot of the stagecoach road too. I had to walk a bit of a distance and cross large cobble size rocks that could trip up anybody before getting to the hard-packed sand. But I did it. And the weather was so warm, I didn’t need a jacket. Then I headed back to Tillamook and the Blimp Hangar and Air Museum south of town. I had an appointment with Phyllis Rice, the acquisitions person. We had a great visit. She handed me a copy of my story that I had previously sent. It had been checked over with some changes, which I will make. I based my story on last year’s research and some changes have occurred. 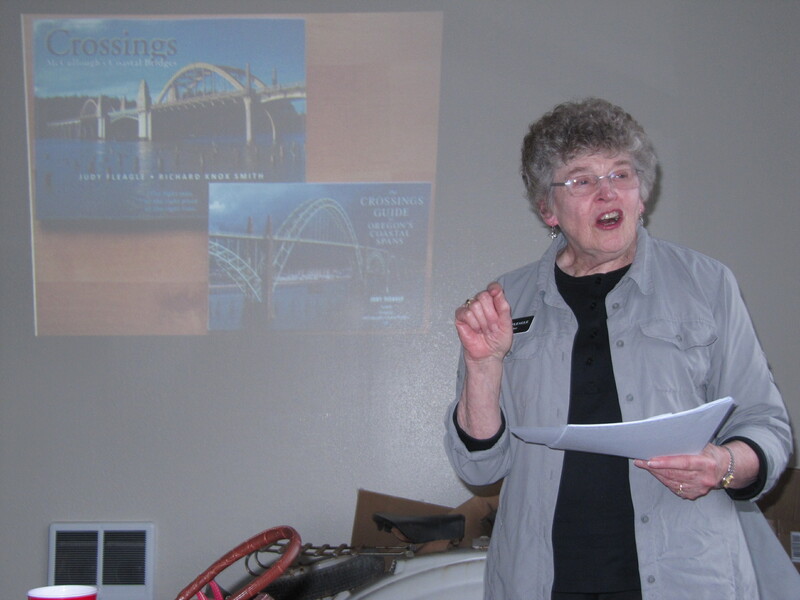 She also bought 20 copies of The Crossings Guide. Then back through Tillamook and east on Hwy 6 to the Tillamook Forest Center. I had never been there, but it is a fabulous place that I wrote about numerous times for Oregon Coast magazine. I chose it for the book because it is a first-class facility deep in the forest—totally UNEXPECTED. And it has an incredible story to tell of the devastation of the Tillamook Burn fires and the amazing recovery effort of replanting an entire forest. 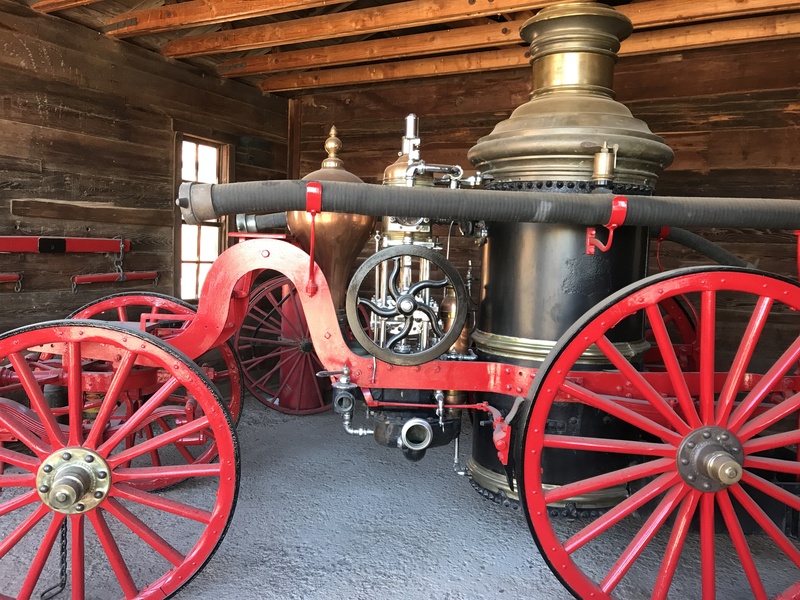 I checked with the person who is checking over my story, talked to a docent from a local pioneer family, saw the film “Legacy of Fire,” and toured the whole facility. Definitely worth a visit. The weather there was sunny and warm. The Tillamook Forest Center’s lookout tower is 40-feet tall. Great view! Then I headed through Tillamook over to the Three Capes Loop to Cape Meares. Not easy to get to any more, since the road is closed from Bayocean to Cape Meares since 2017. It’s very round-about and slow and the road the last half mile was terrible. It had turned into one of those absolutely gorgeous days at the coast. Sunny, no wind and very clear. Perfect for photos. So I got a great one of the short, stubby lighthouse and of the Octopus Tree. I had to walk a distance in one direction to see the lighthouse. And on the opposite side of the parking lot, I found a trail and hiked the nearly half mile to the Octopus Tree. Some branches have broken off, but it is still such an unexpected sight. On both the walk to the lighthouse and the Octopus Tree, I got winded on the uphill sections, and had to walk very slowly on the downhill sections. The trail was wet and mucky in places. So I walked on the edges. Easy to slip and fall. I made it safely and felt good about that. The view south from Cape Meares. I was getting tired, and it was 6 p.m, and I still needed to drive three hours to Florence. I almost skipped Munson Falls, but I’m glad I talked myself into doing it. So back to and through Tillamook and south of town a few miles to the turnoff to the falls. I have never seen a good photograph of this falls, and they are the tallest in the state of Oregon next to Multnomah Falls and very few people know about them. The state park is described as only partially developed and I found that to be true. I turned off 101 onto a one-lane funkily paved road with scattered homes, which turned into a graveled logging road, which turned into the state park road. It was still single lane with potholes big enough to swallow a car. If I could’ve turned around, I would’ve. The total distance from 101 was probably less than three miles but seemed much longer. The speed limit was 25 mph. Ha! It was more like 2 or 3 mph navigating the potholes. I was so glad I didn’t meet anyone coming in. There was one car in the parking lot. I took off along the the trail , which was in good shape with only a few mucky spots. On the one steep part, there was a hand rail. So I was good. It was about a quarter mile to the viewpoint. There were steps down to another viewpoint at the base of the falls, but with no handrails, I didn’t even attempt that part. The falls were full and impressive in their length, even though you can’t see the bottom portion. I got what I think is a better photo than I’ve ever seen of these falls. And the trail follows the creek, which has a number of smaller falls. It was a lovely walk. I met three sets of folks coming up the trail as I was leaving and was able to let them know what a treat they were in for. Going out on the road was just as hairy as coming in, but I didn’t meet any cars and was very relieved to get back to Hwy 101. 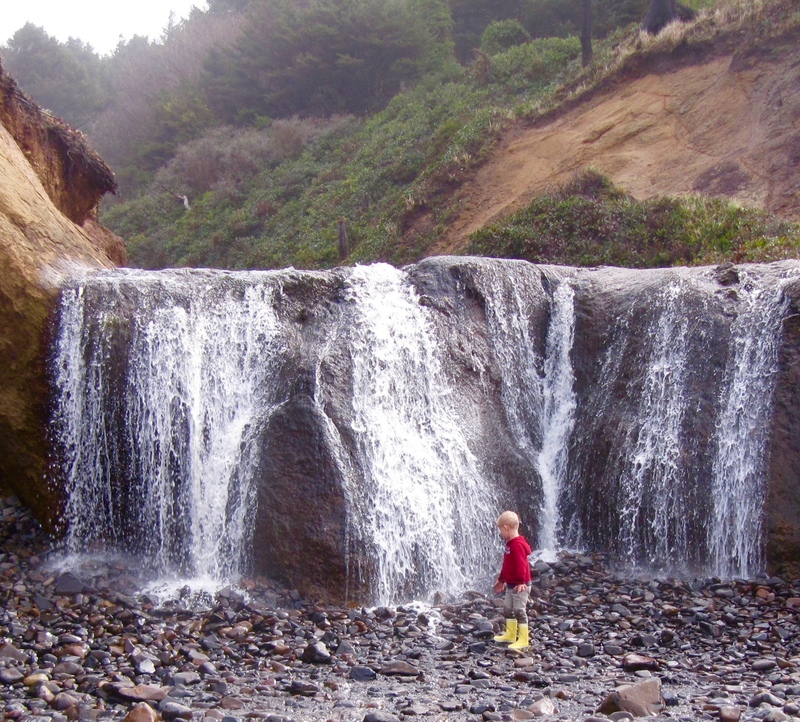 When I got to Lincoln City, I turned into the D River Recreation Area—very crowded. Still warm and lovely. I parked and walked up to the highway to get photos of the sign about D River, World’s Shortest and a photo of the river. I think both will be usable. Then I headed home. By the time I got there, it was almost totally dark, the fog was coming in, and the drizzle had begun. As far as I was concerned, the day had been a success. I accomplished everything I wanted to as far as factchecking for my book. And best of all, I could handle the five different times I had to walk a distance whether on beaches or in the forest. Yes, a totally successful day. Note: I will be visiting family and friends in California for a few weeks, but someone will be here with Groucho while I’m gone. So no more blog posts until mid-May.